Welcome! 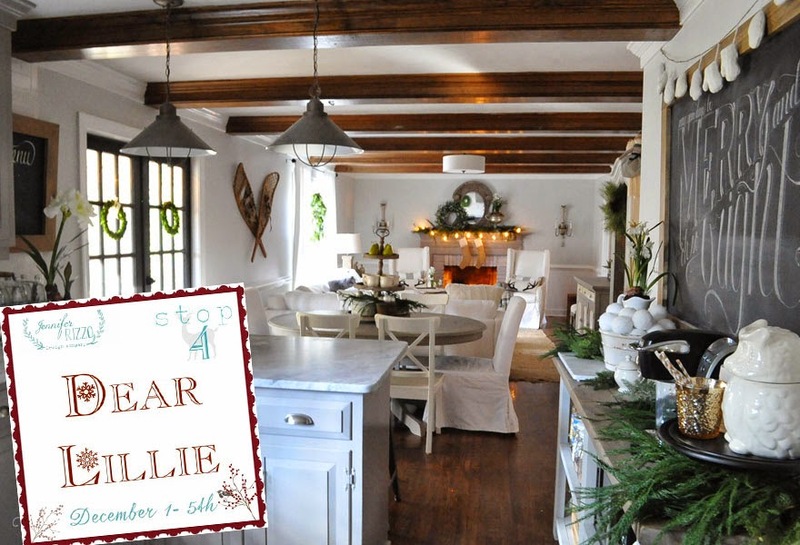 I am so excited to be a part of Jennifer Rizzo's Holiday House Walk again this year. 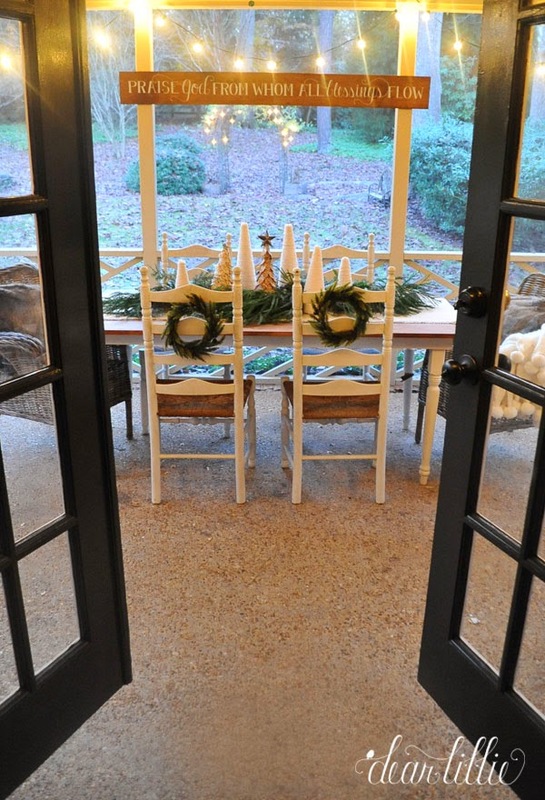 I love getting to have a virtual tour through so many beautiful homes each year all decked out for Christmas. I can't wait to see what everyone has done this year. Last Christmas we were midway through making over pretty much every room in our house so honestly decorating for Christmas was more stressful than usual. Now that we've done the majority of work in most of the rooms it was a lot more fun to add all the holiday trimmings to the house. 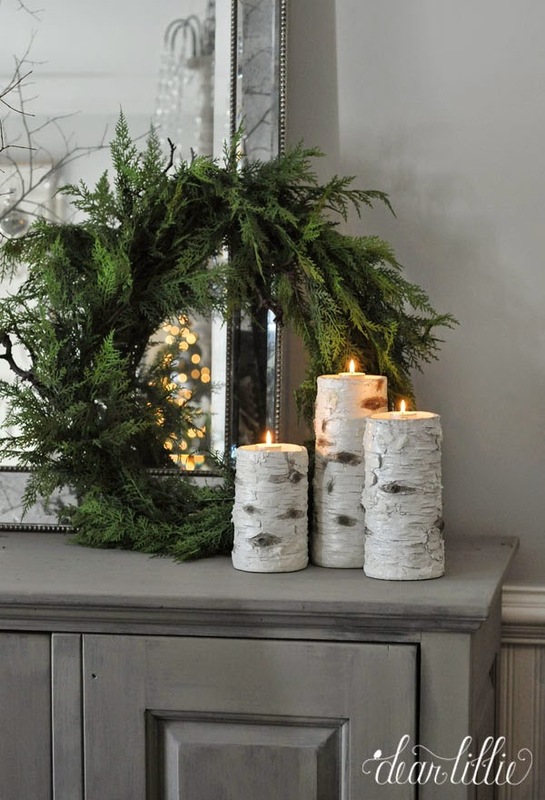 We kept things pretty simple by just adding some greenery and paperwhites and a few other wintery touches throughout the house. I wanted to avoid that cluttered feeling this year that I have felt in years past when we've tried to add a few too many things. 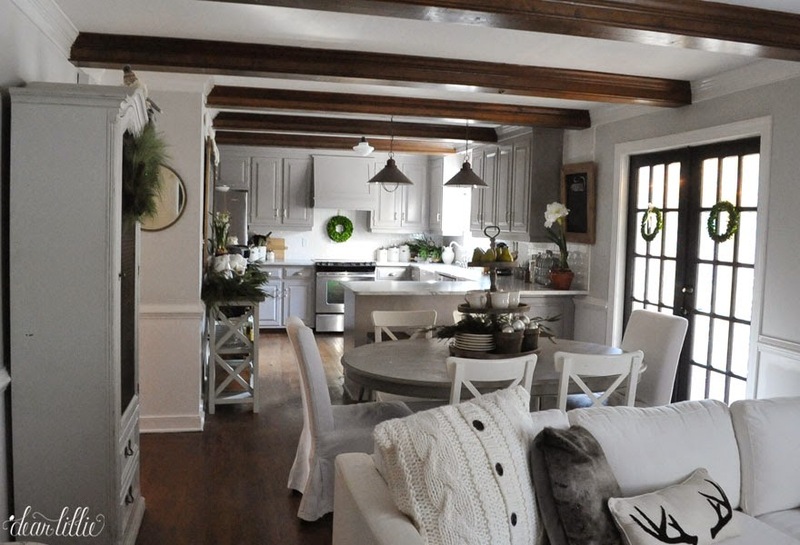 We'll start with the room we spend the majority of our time in which is one long space that makes up our kitchen and family room. 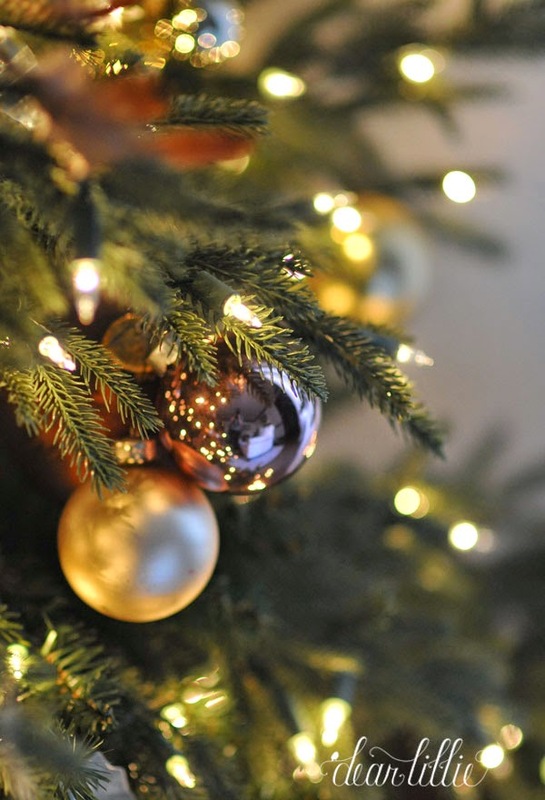 I'll try to give the sources for all of our Christmas decor here in this post and then you can find detailed source list and paint color info for all of the rooms here. 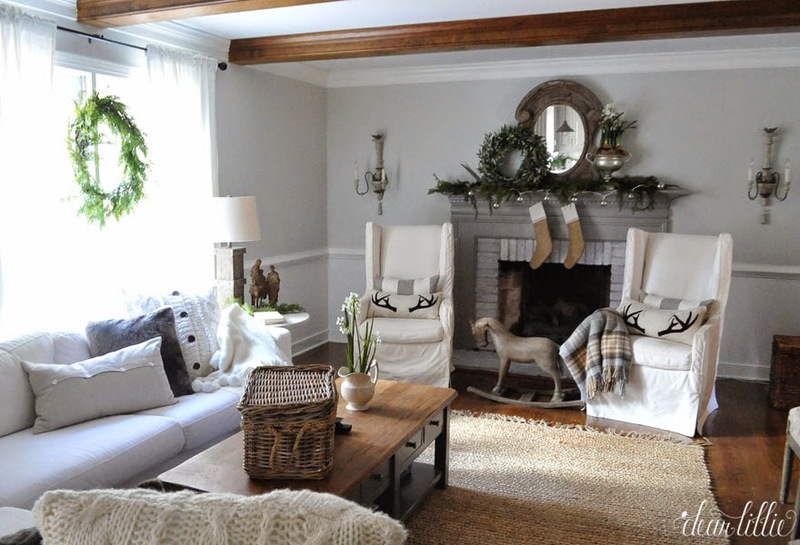 In this room we added a cedar wreath and garland from Savvy Home and Garden and all of the paperwhites you see throughout our house are from there as well. They are faux ones that I have been slowly acquiring for the the last 6 years so I now have a decent little collection of them. They are quite realistic looking though and have held up so well I can't resist. I made the stockings several years ago. I wanted to switch those out for some white cable knit ones once I find what I have in my head. 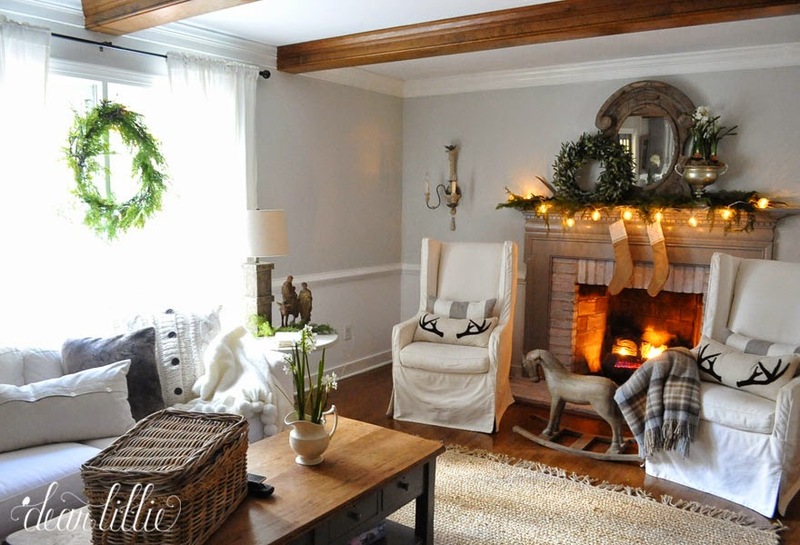 =) The lights on the mantel are from World Market and the wreath on the mantel and antler pillows are both from Birch Lane. 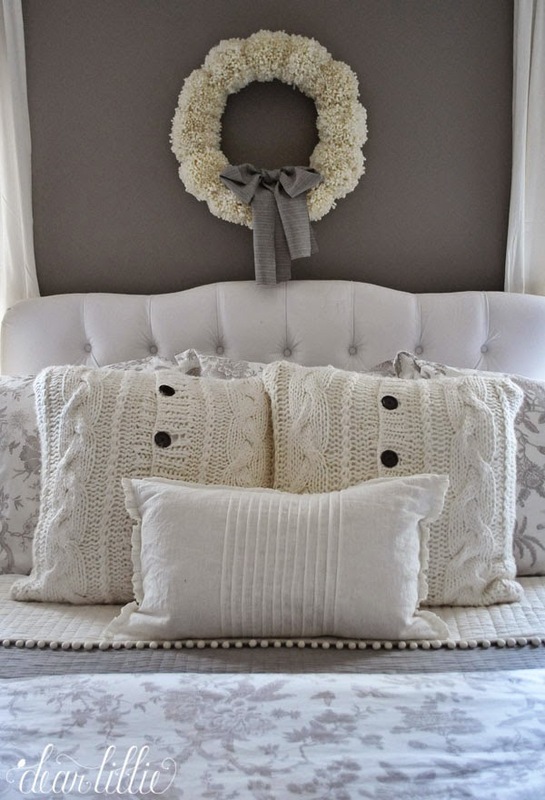 The cable knit pillows (which are my favorite addition this year!) 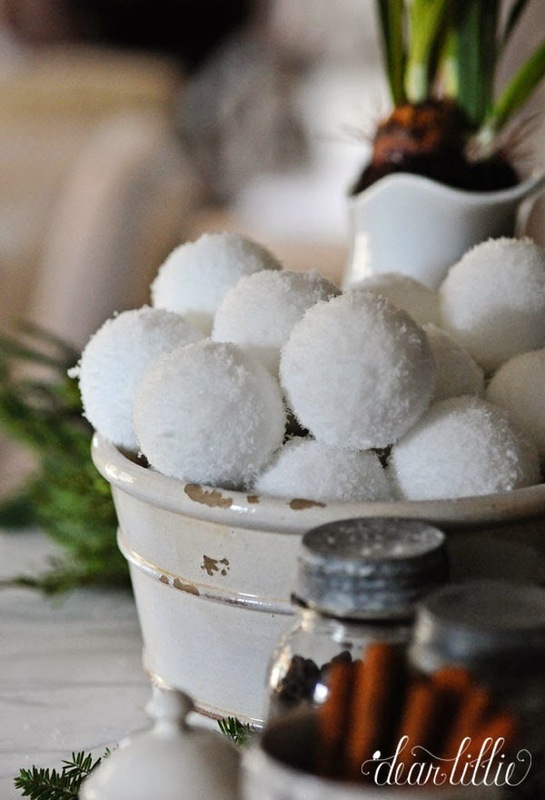 and pom pom throw are from Soft Surroundings. 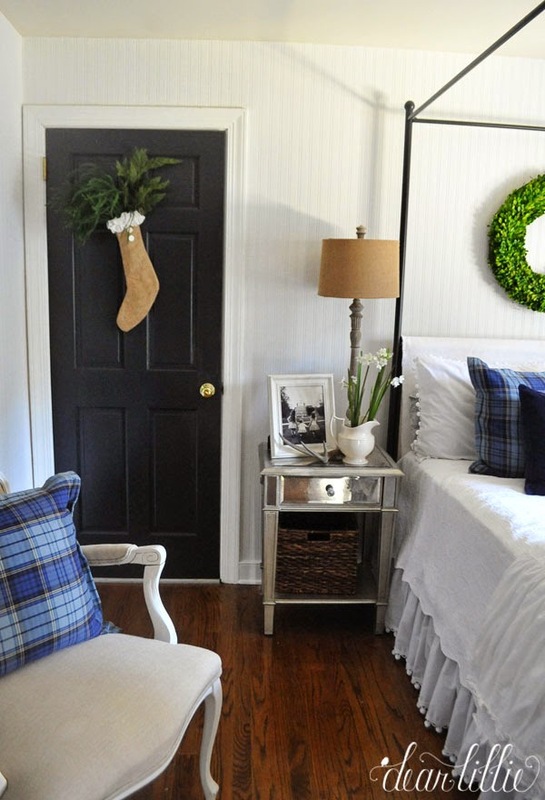 The plaid throw is from HomeGoods. Info on pretty much the rest of the items in the room can be found here. The snowshoes were an early Christmas gift from my mom from an antique shop in NH. I've been wanting a pair for the last few years so I am quite excited about them! 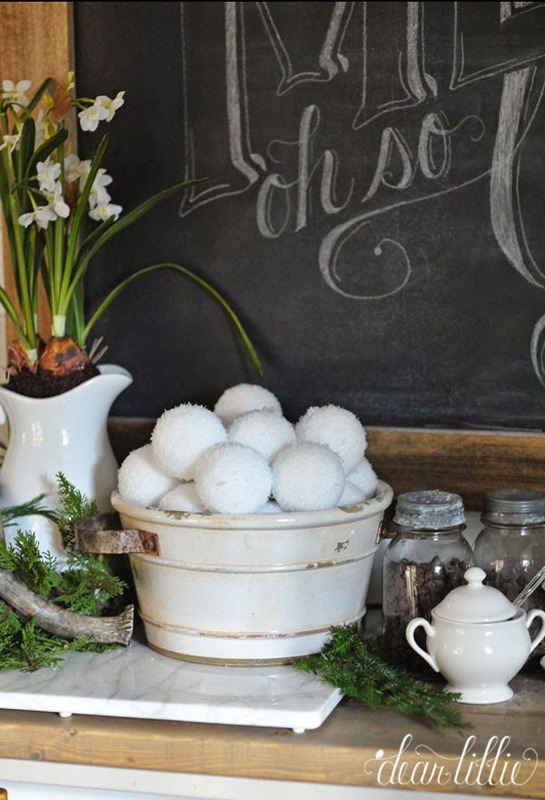 The mini boxwood wreaths are from Soft Surroundings and the amaryllis plant is from Savvy. Here's the fireplace without a fire going and the lights off. 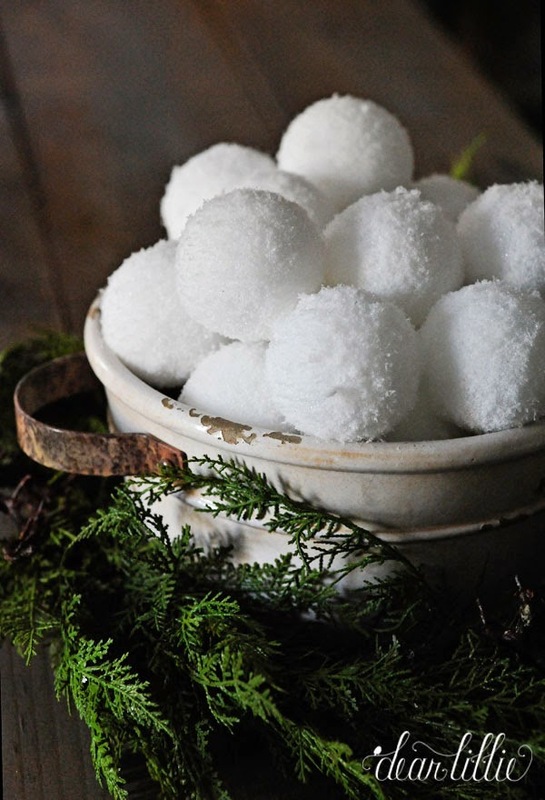 One of our favorite projects this year was making these snowballs. 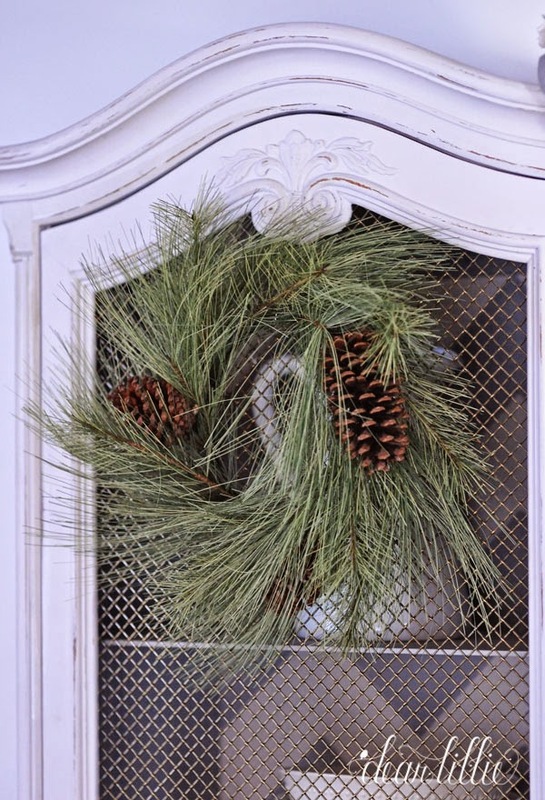 We used this tutorial from Lucy at Craftberry Bush. 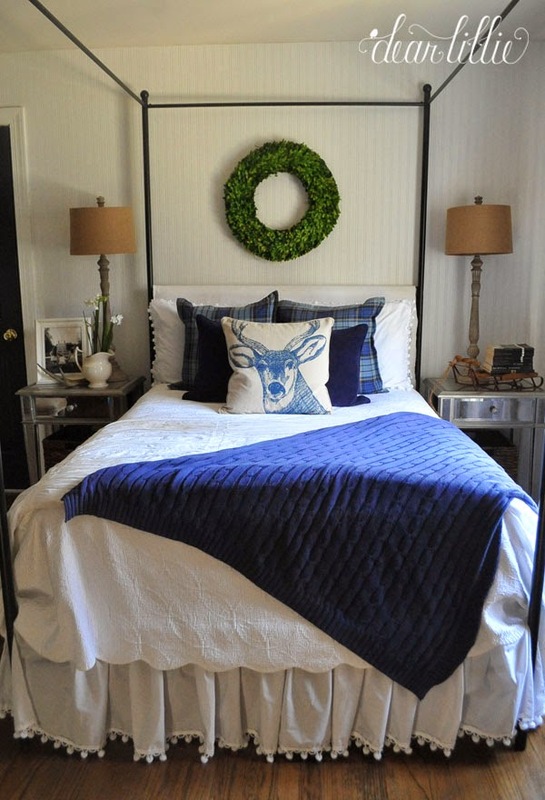 This little pine wreath is from Savvy. 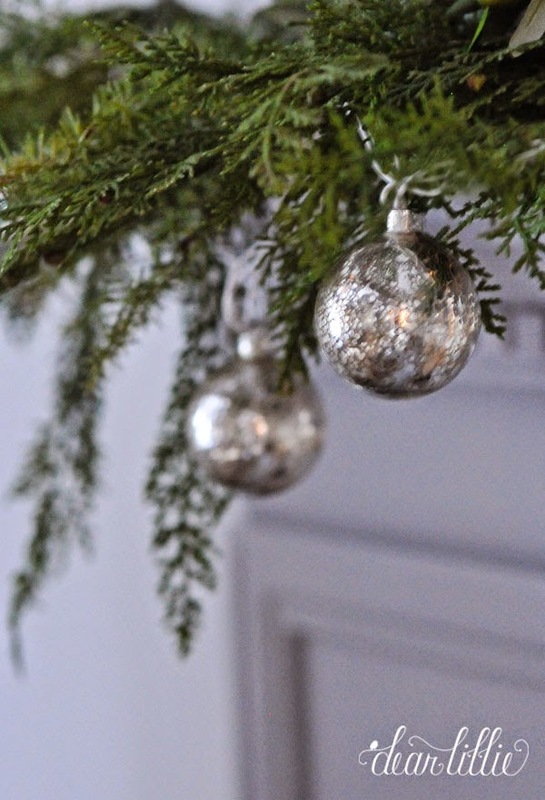 This is what the little mercury glass lights on the mantel look like close up. 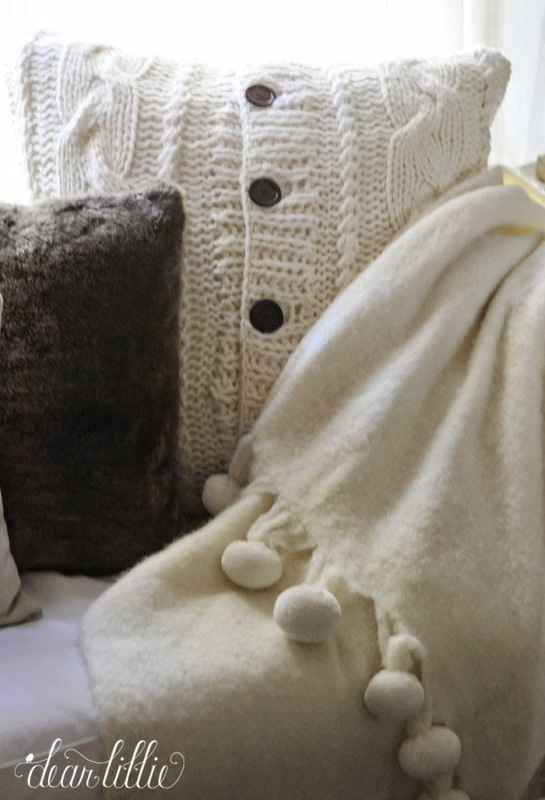 And a close-up of the cable-knit pillow and throw from Soft Surroundings. 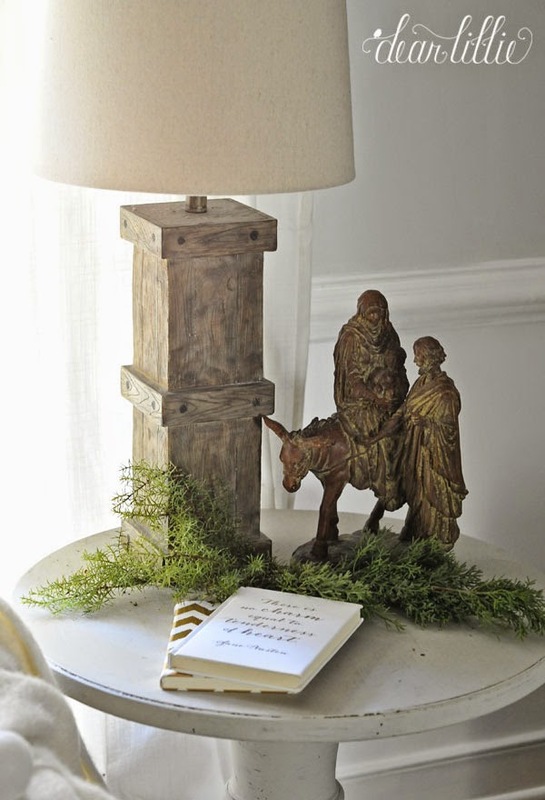 This Mary and Joseph figurine is one of my favorite items and was a gift from my mom last Christmas from Savvy. 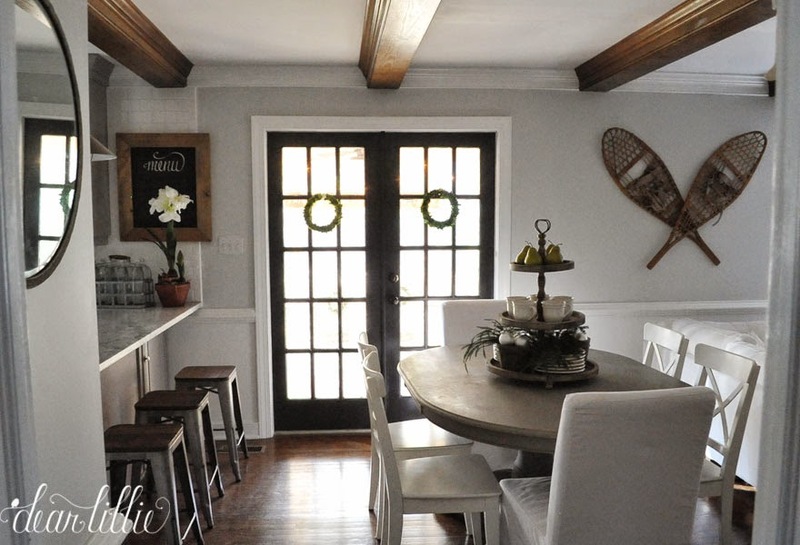 And here are a few images of our dining room. I will probably do some kind of Christmas table setting in the next week or two but for now this is what it look like. The wreath and paperwhites are from Savvy, the Birch candles and mini cable knit pillows are from Soft Surroundings, the skates were mine as a child and mercury glass ornaments were from Target years ago. We made this sign and it's available in our shop (although it's currently sold out but we will be listing another batch later this week). We got this driftwood nativity at HomeGoods. Here's a little peek at our den. 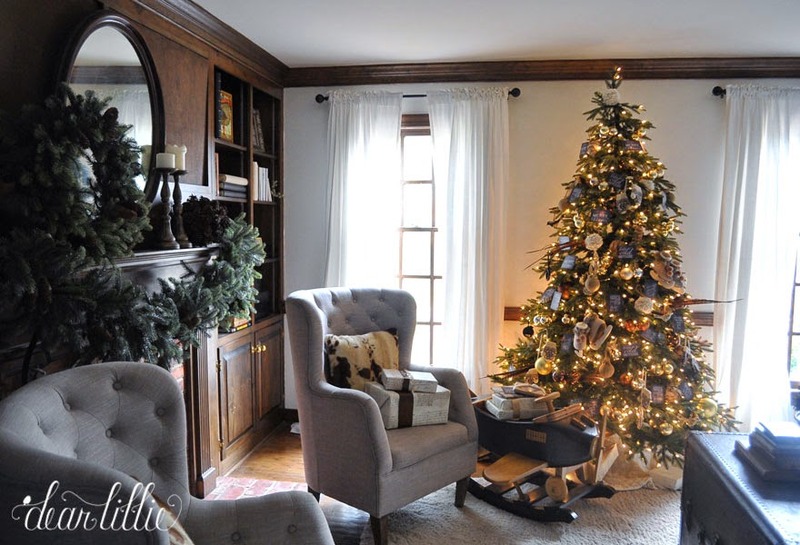 We'll have more pictures of this room and this lovely tree from our sponsor Balsam Hill next week! 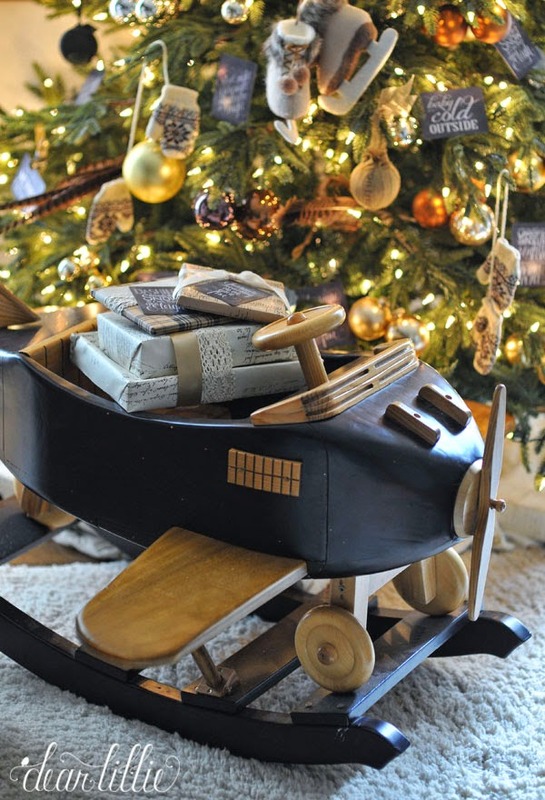 The sled is from an antique shop in NH. The stocking is from Balsam Hill, the wreath and garland are from Savvy and the pine cone ball is from Pottery Barn (eight years ago), the candlesticks are from Hobby Lobby (also about eight years ago). 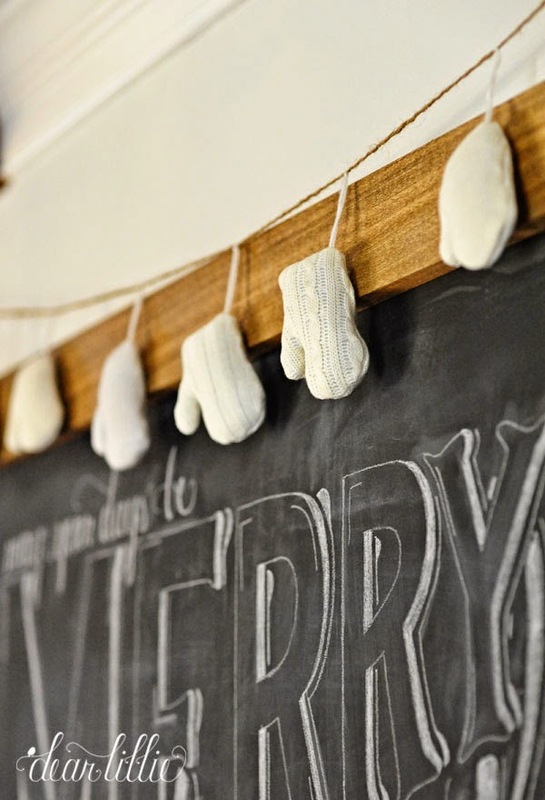 The girls love these knit skate ornaments from Soft Surroundings. In fact, almost every time I walk into this room I discover they've been moved to another spot on the tree. 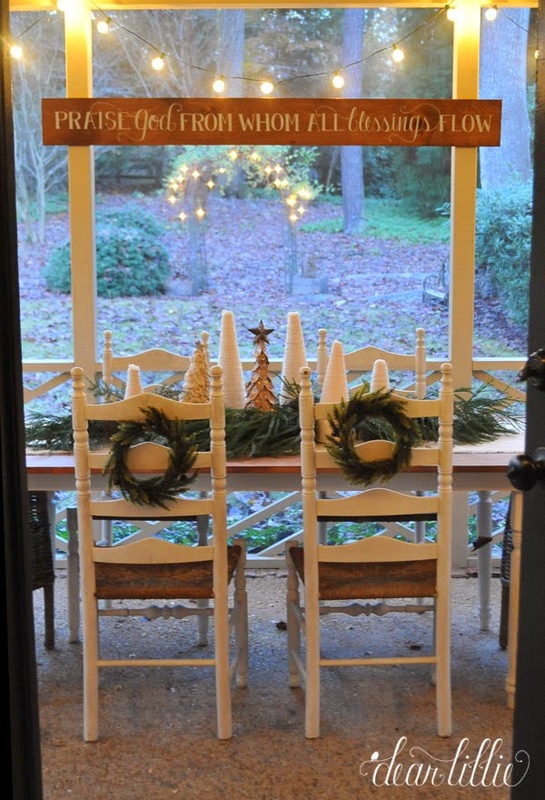 Next we have our back porch. Here's one little corner. 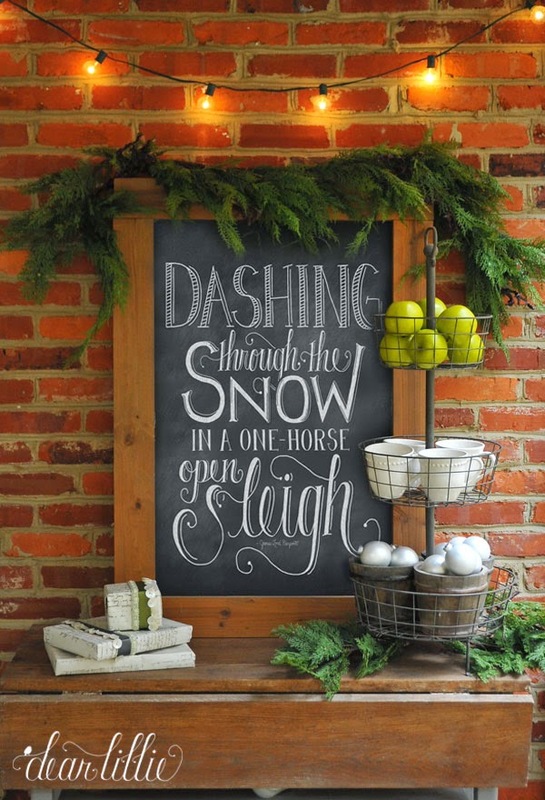 And today (Dec. 1st) as a thank you we have marked all of our chalkboard downloads down and they are half off! (No discount code needed - they've already been reduced. This is just for today). 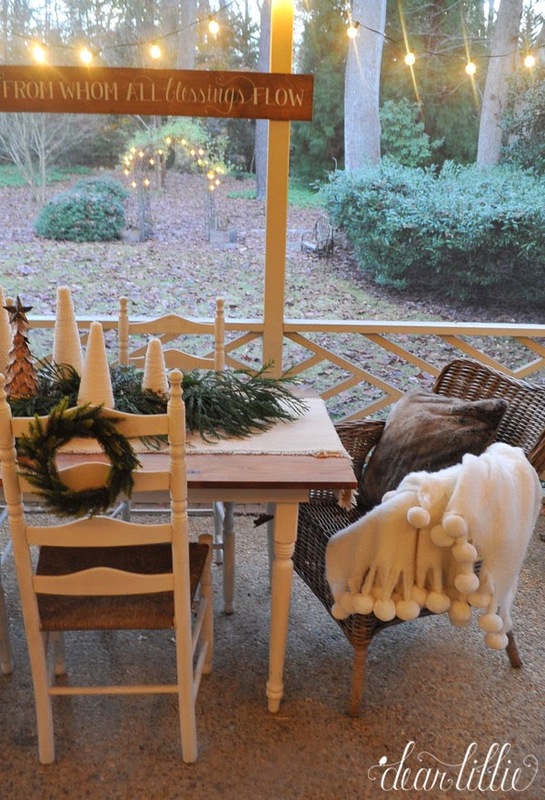 And here's our table on the porch. 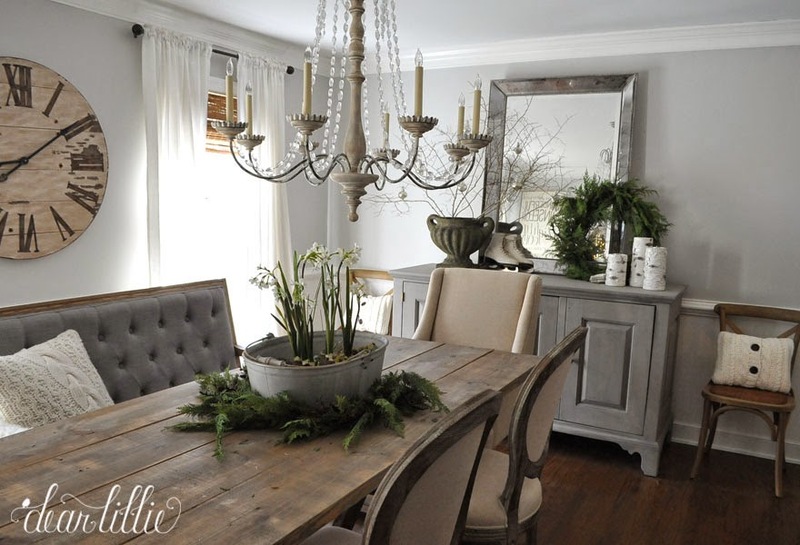 We used the same mix of trees we used on this table in our last house a couple of years ago. You can find our tutorial for the yarn trees here. We also made the sign above the table which you can find in our shop here. 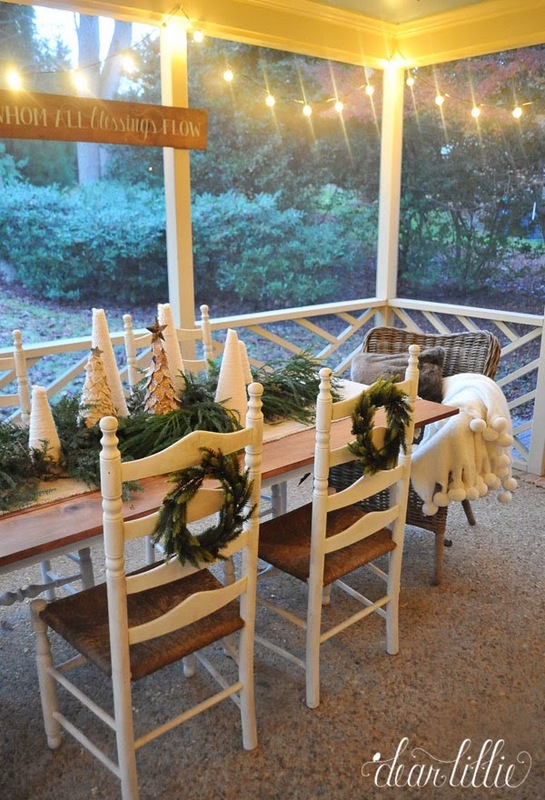 The Christmas tree with the star in the center of the table was a gift from my mother-in-law 7 or so years ago and the wreaths on the chairs are from Savvy about six years ago. The greenery on the table is from the yard. 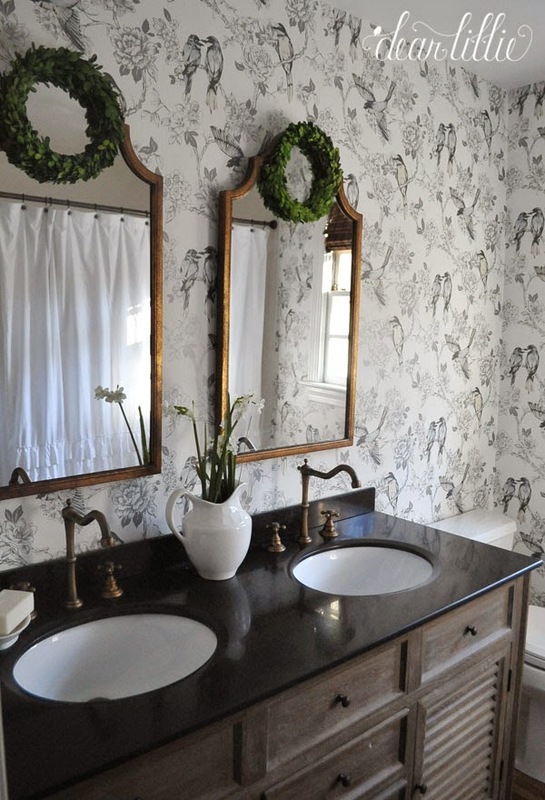 Then upstairs we added some mini boxwood wreaths from Soft Surroundings to the mirrors in the hall bathroom. 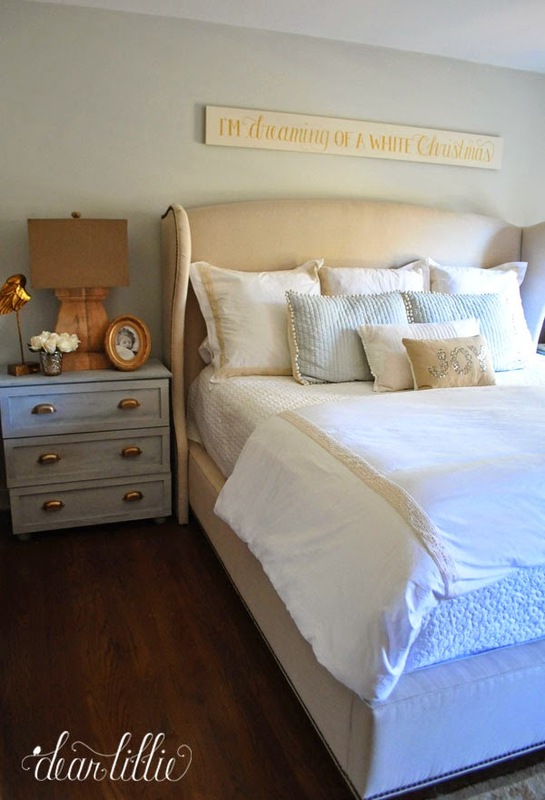 And here's a little peek at one of the bedroom. I'll share more images once I finish going through them. 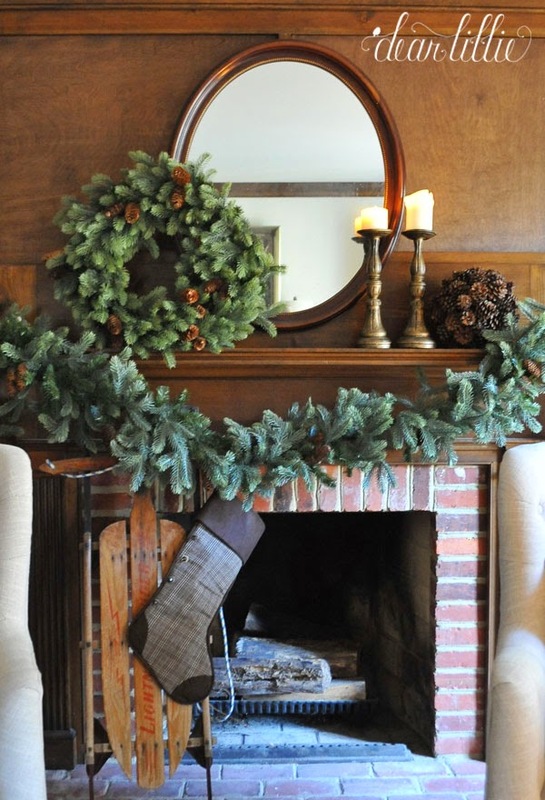 The stocking I made years ago and the pillow in the chair is from HomeGoods. 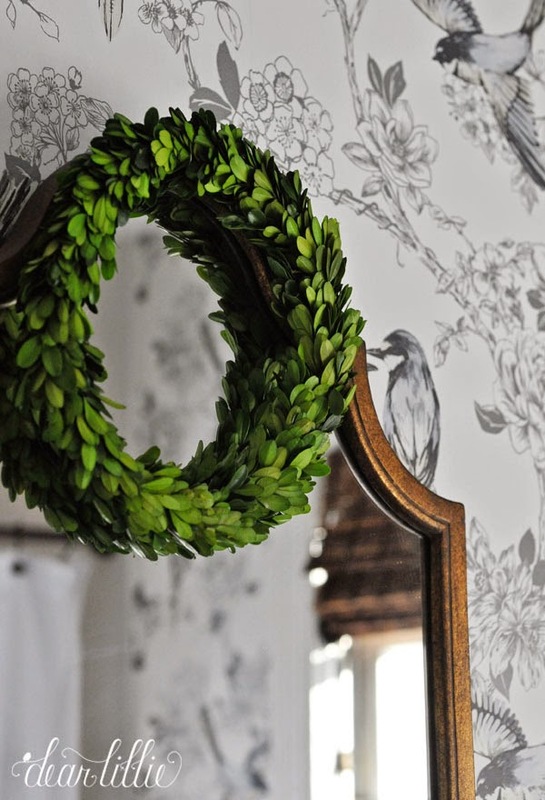 The HUGE boxwood wreath just came from the Painted Fox a couple of days ago and it is beautiful! I am so happy with it! 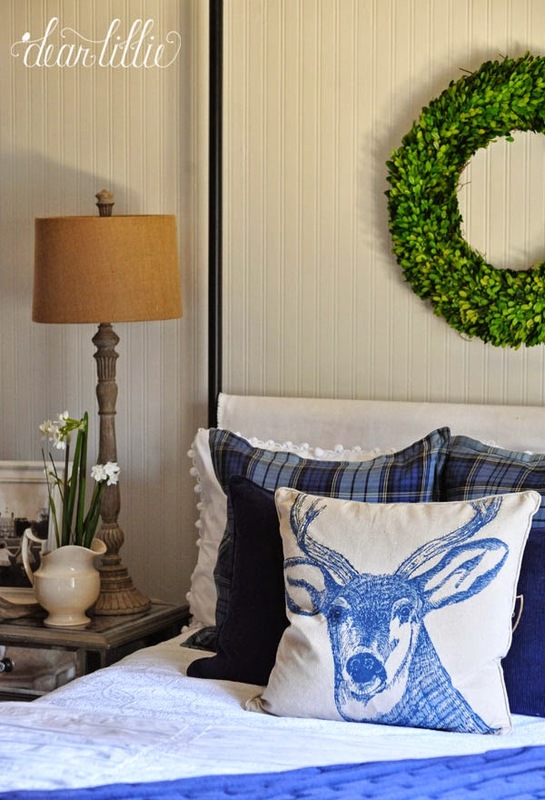 All the decorative pillows on the bed are from HomeGoods. I'll share more images of this room soon. 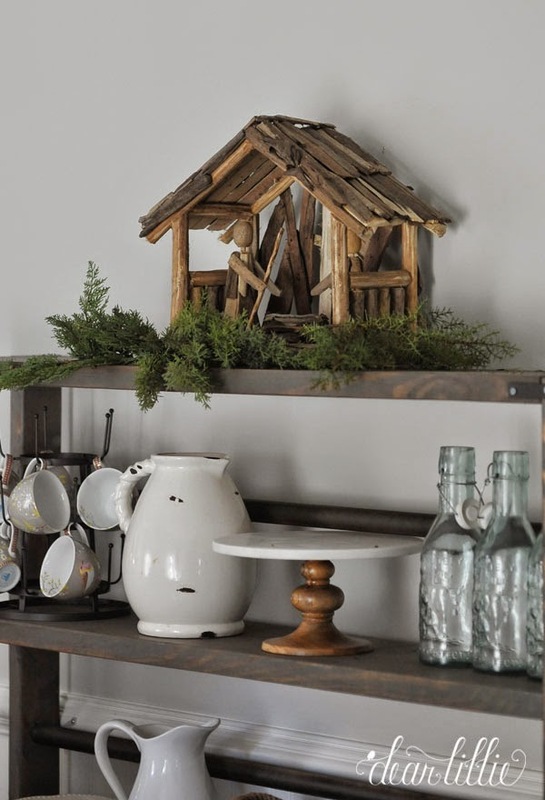 I actually haven't finished this room yet, but here's how I quickly set it up to take some product shots of our Silent Night download a couple of weeks ago. Once I do get it decorated I'll share those on here as well. 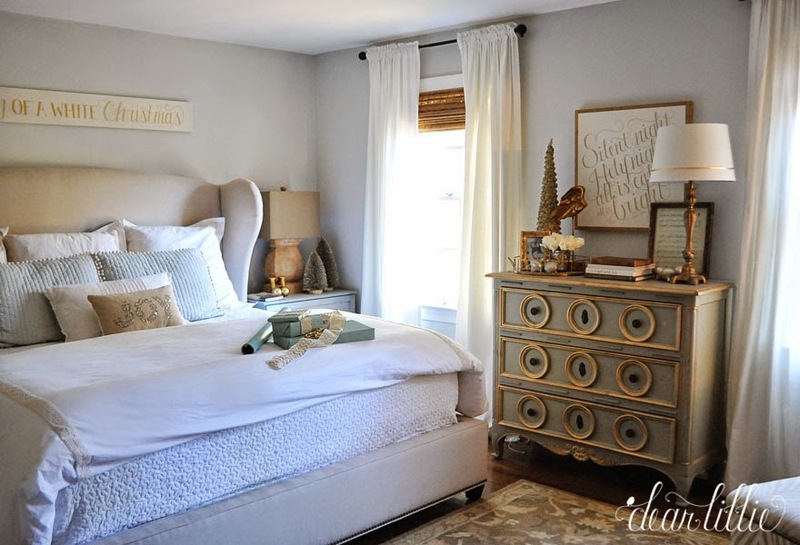 And here are a few images of our master bedroom. The bottle brush trees on the nightstand are from Target. 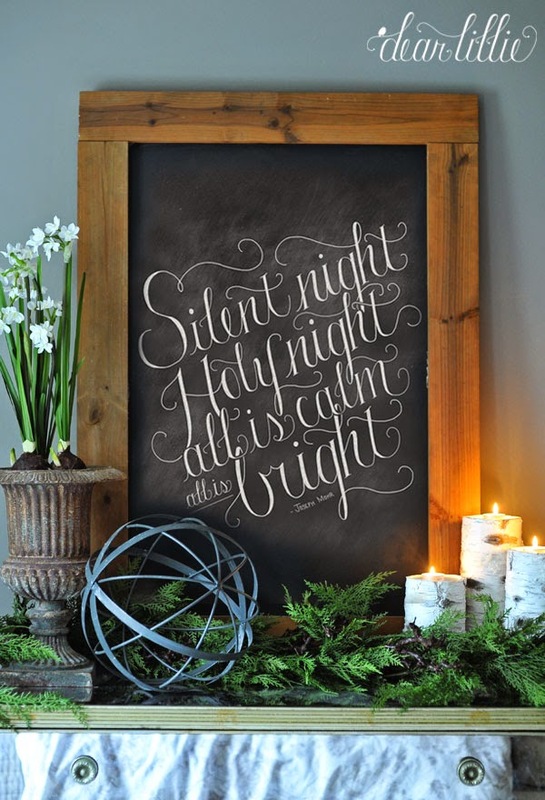 We made the Silent Night sign and it's available here. 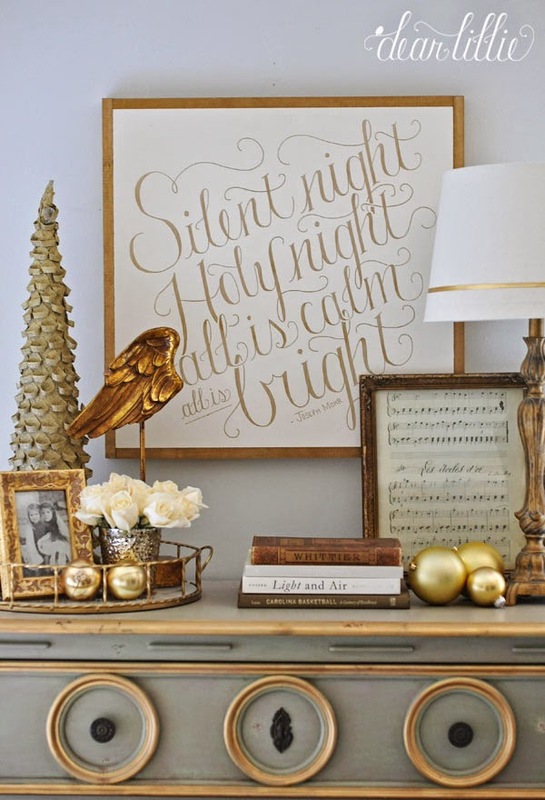 The tall gold tree is from HomeGoods and the angel wing is from Hobby Lobby years and years ago. 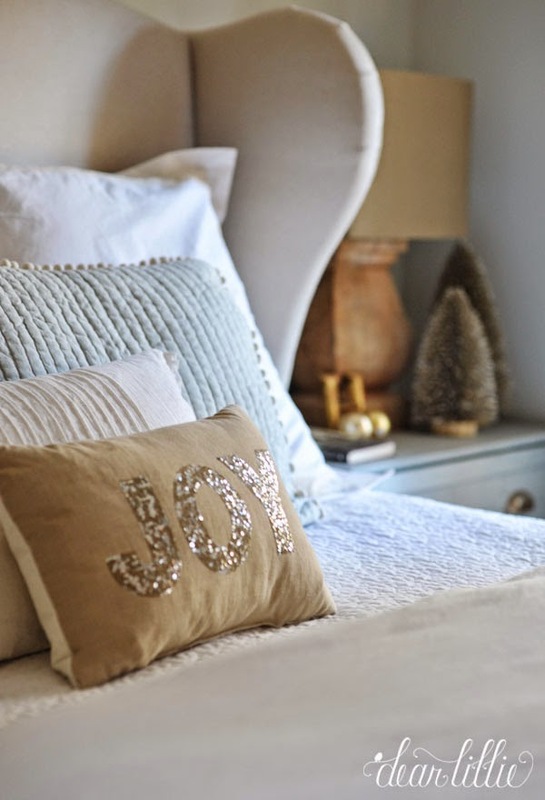 The Joy pillow is from Target. 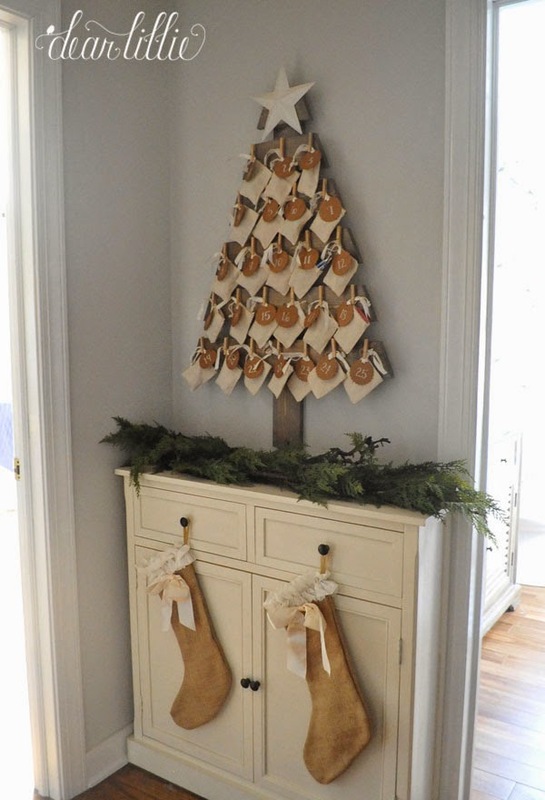 And then in our hallway we added this Wooden Advent Calendar. You can find the tutorial for it here. 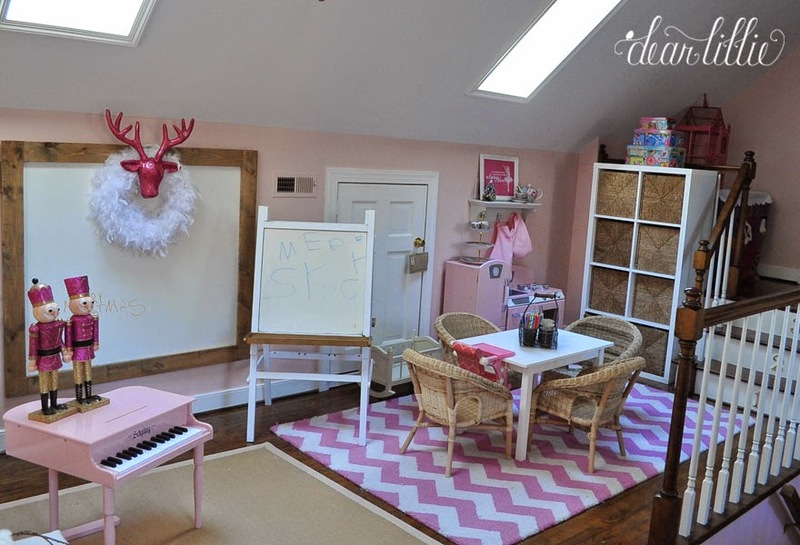 And then the last room is the playroom. 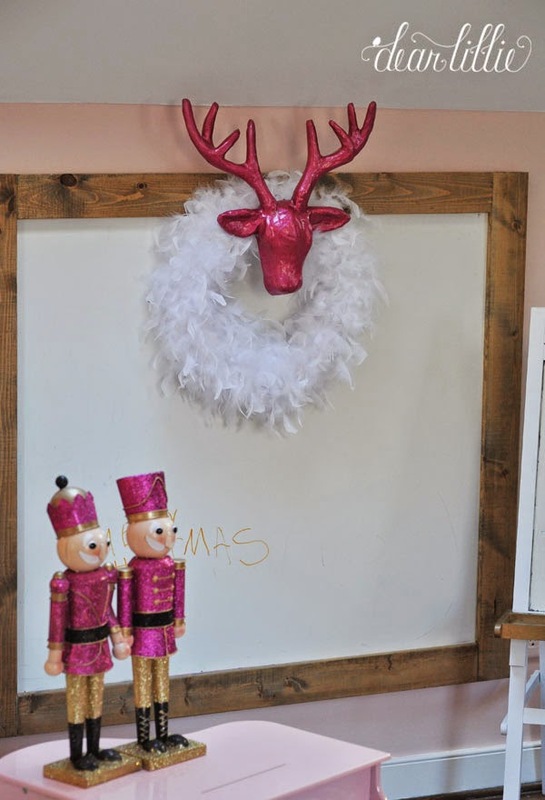 We kept the house really neutral and simple this year but then we went BRIGHT with lots of pink and gold in the playroom! 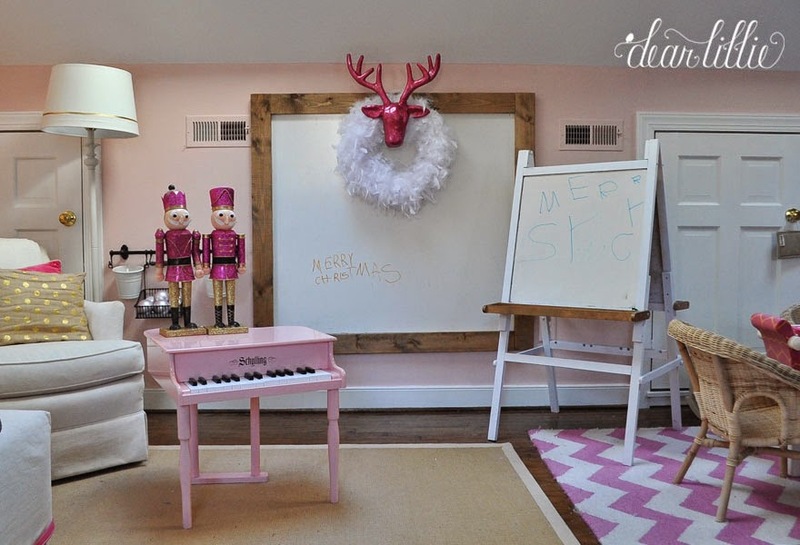 As I have mentioned before, I was not thrilled with the idea of doing an all pink playroom when we made it over earlier this year, but once we finished it I had to admit I was more happy with it than I anticipated and decorating it for Christmas was a lot more fun than I expected too. And of course the girls got quite excited about it. 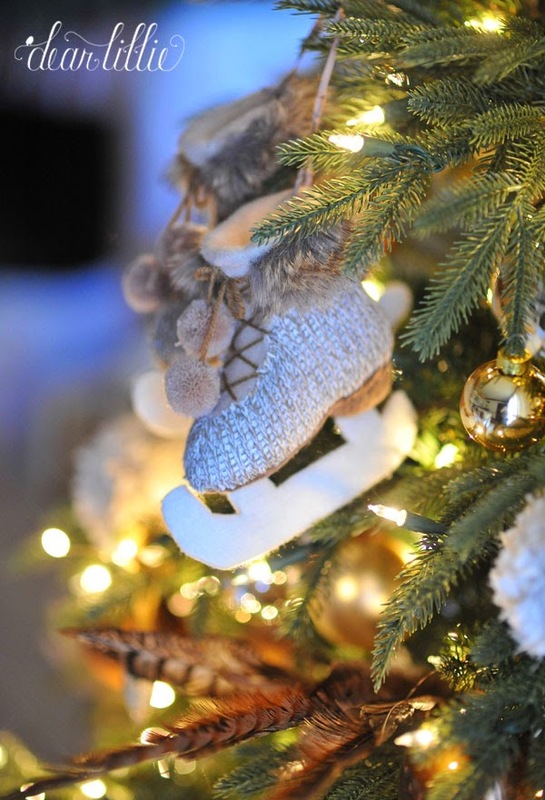 The white tree was from our sponsor Balsam Hill. The girls were so excited to have a white tree and 4.5 foot one was the perfect size for in here. 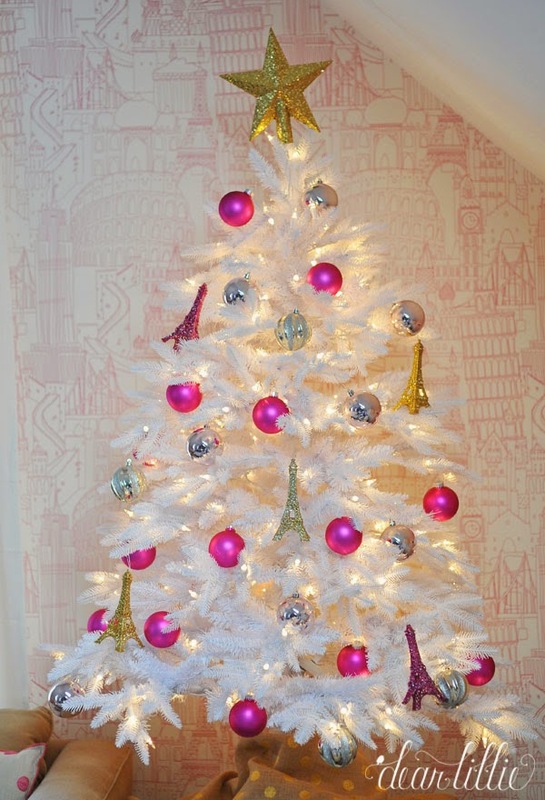 The bright pink balls are from Michael's, the eiffel towers and star are from World Market and the rest of the ornaments are from HomeGoods. The polka dot burlap fabric just kind of thrown around the base of the tree was leftover from some projects earlier this year and was from Joann's. 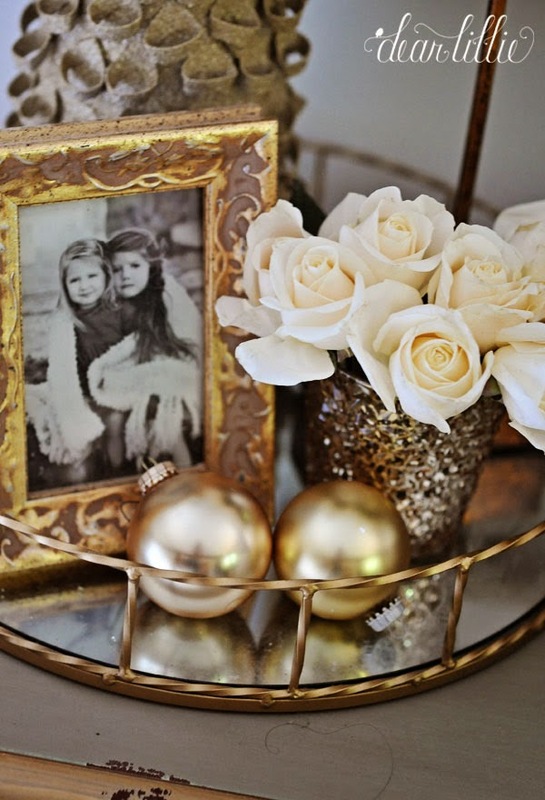 The gold striped candles are from World Market and the little sleds were decorative ones we've had for years and years that we painted white and gold. 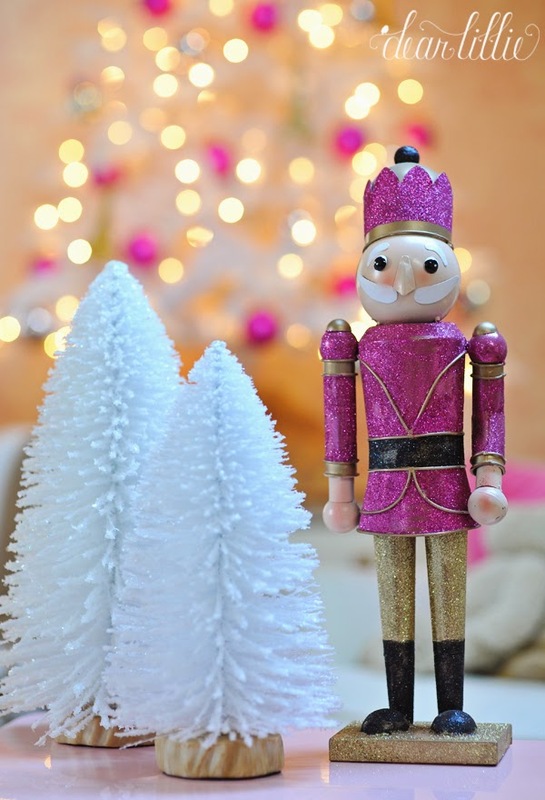 The bottlebrush trees are from Target and the nutcracker was from HomeGoods last year. 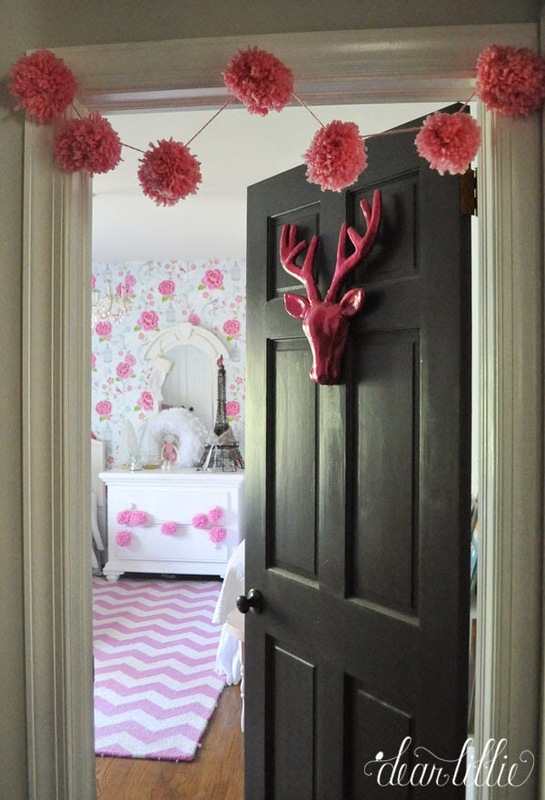 The girls convinced me to paint this deer head from Michael's bright glittery pink and I have to say it was kind of a DIY gone wrong. It is sooo shiny and looks pretty awful in real life. They really were quite cute before we painted them. The girls, of course, think they look fabulous (there's one in their playroom and the other one is on their bedroom door). The feather boa wreath is from HomeGoods. 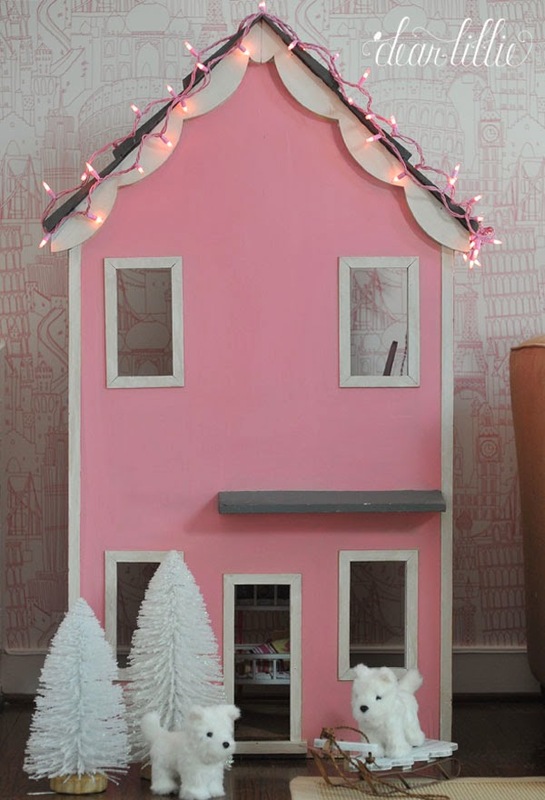 We found this playhouse for such a great deal at an antique shop last Christmas and had fun adding some pink lights to it this yerar. Well, that's it for our house. 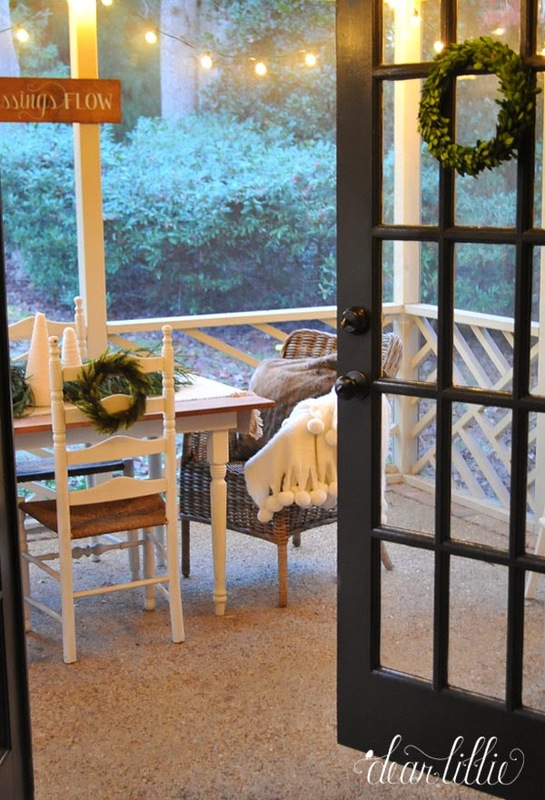 Now it's time to head over to Courtney's house from French Country Cottage. Her home is always stunning and her photography is always a work of art! 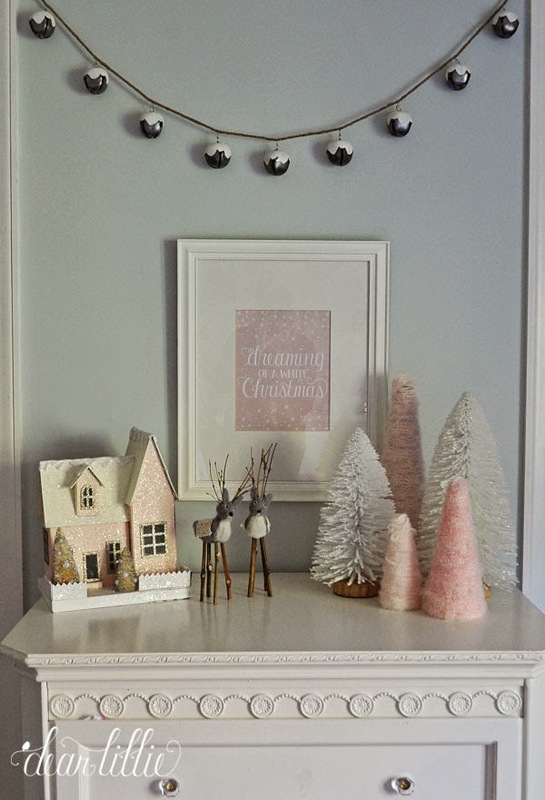 And don't forget, if you have questions on non-Christmas items found in any of these photos above and paint color info you can find just about all of that here. And I am guessing there are probably a ton of typos in this post - I am actually typing this up at 4:45 because we aren't at home and the place we are at we couldn't get the internet to work until just a couple of hours ago - ah! So although I did try to give all the source info for our holiday items I haven't had time to link to some of them. I will try to come back on here tonight and add some links if I can and fix what I imagine will be a ton of typo =). I need to crawl into bed now though and try to get at least a little bit of sleep before my day starts - ha! I hope you all have a lovely Monday! Thank you so much for stopping by! jennifer, i'm so excited to enjoy your home again this year!! i have to tell you, your master is my favorite!! i just love everything!! 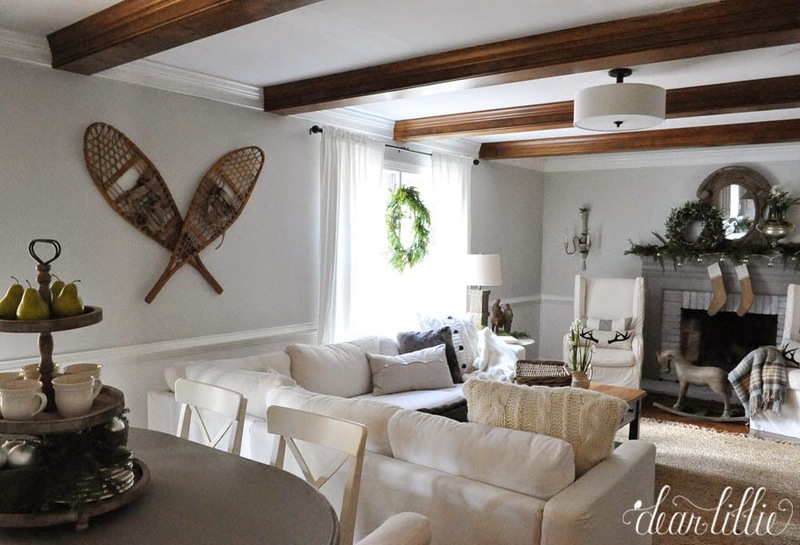 I love the snowy elements of nature that you've captured in your decor. 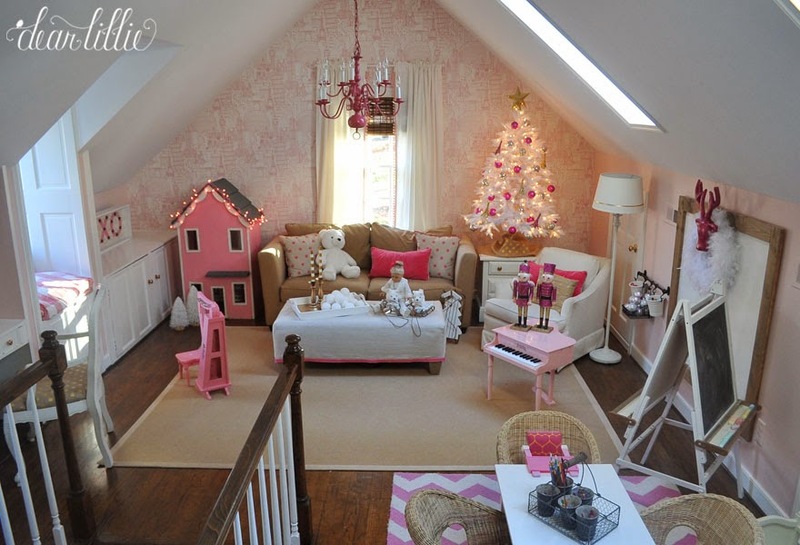 Gorgeous and I adore the pink tree for the girls. Beautifully done. Just gorgeous! 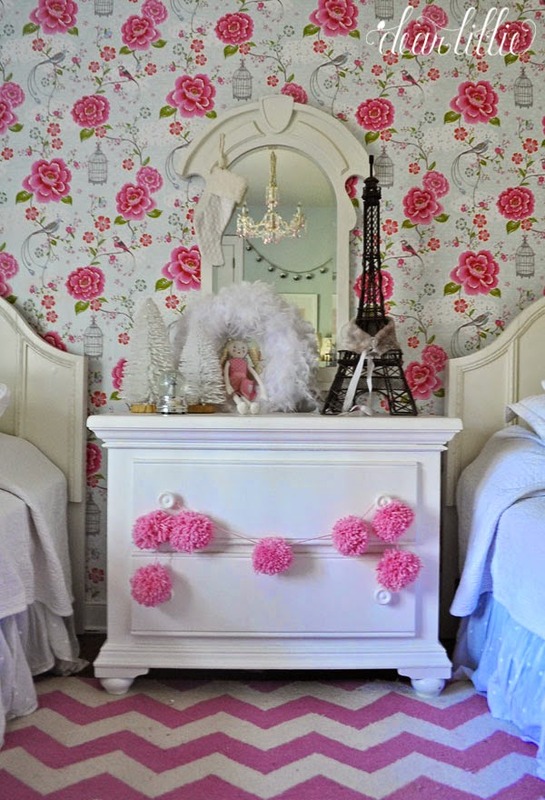 I want to come play with the girls in their pink holiday room. 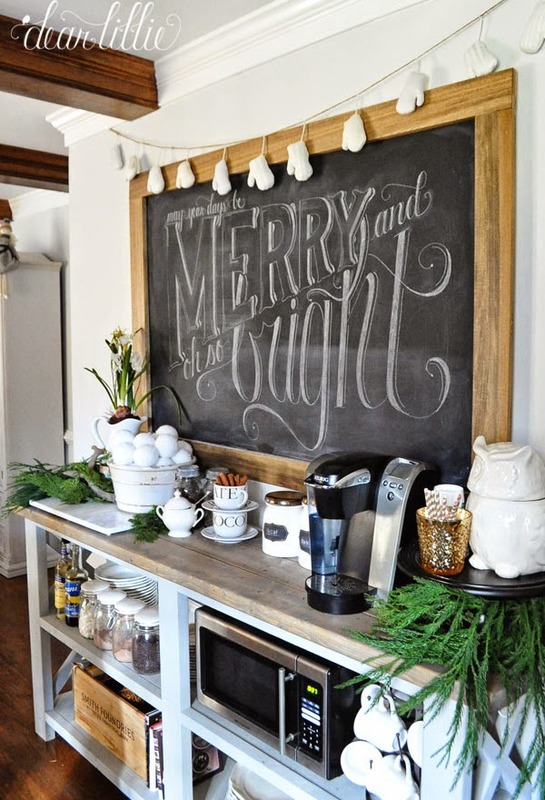 Excited to finish up my frame (from your tutorial) so I can fill it with your beautiful Christmas prints! LOVE IT ALL! Absolutely GORGEOUS! 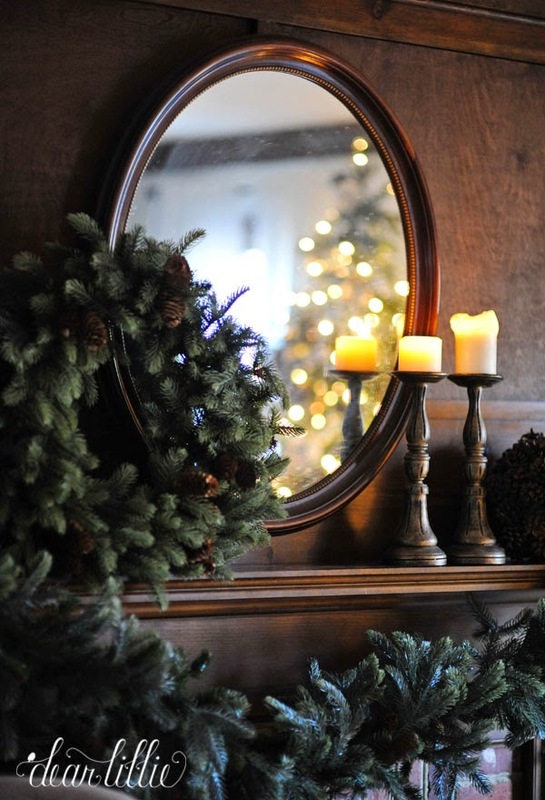 Always look forward to a peek into your beautiful home ;) happy Holidays! 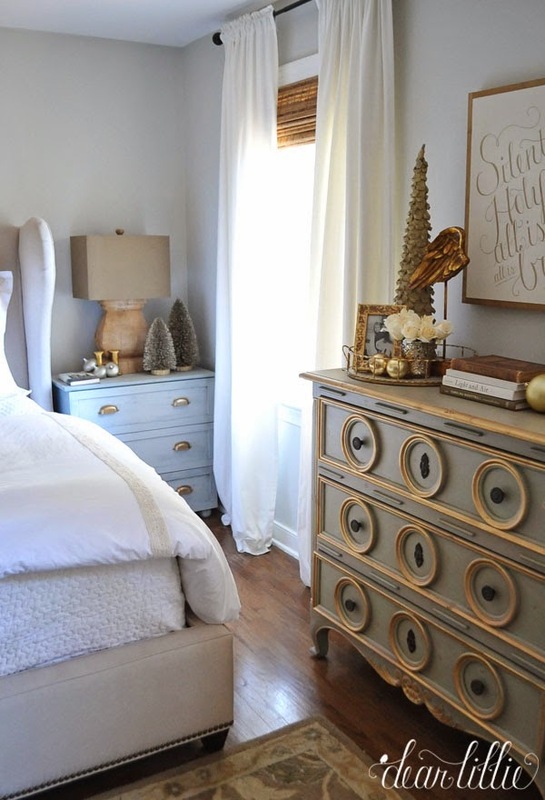 Your home is absolutely gorgeous and so pulled together. 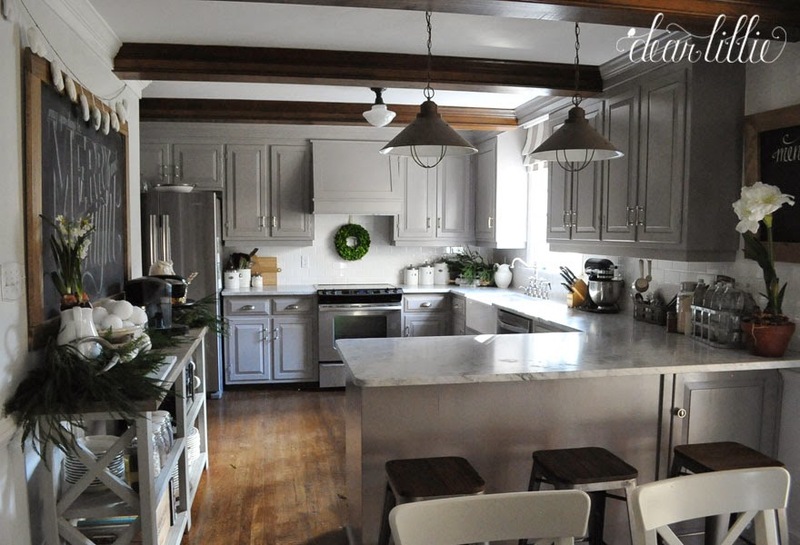 My favorite home tour in a very long time! 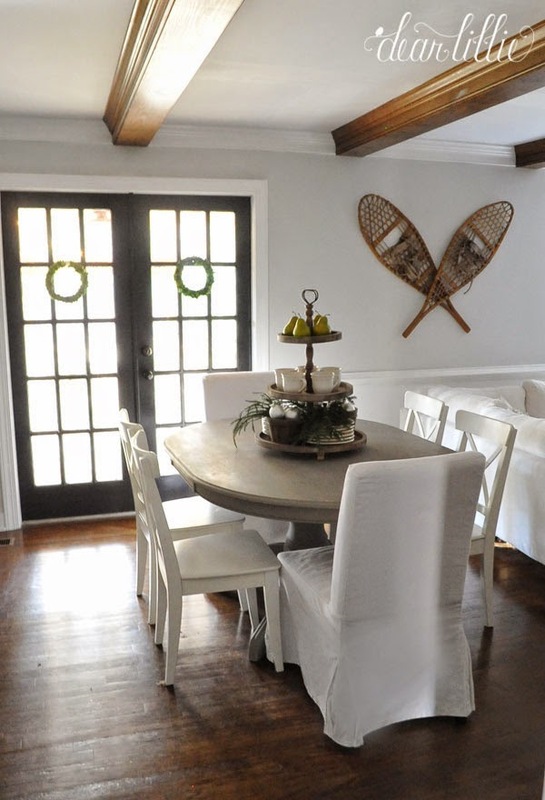 your home is gorgeous- i love the snowshoes! 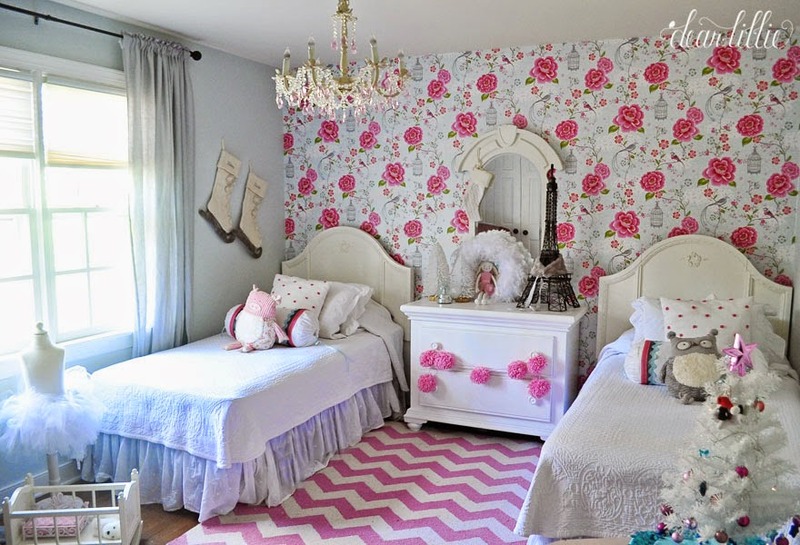 and the kids spaces are just so fun! beautiful job! Jennifer- your home just keeps on getting more beautiful everytime I visit. My Lily will probably want the pink tree...so pretty. every detail. happy holidays. Hi! 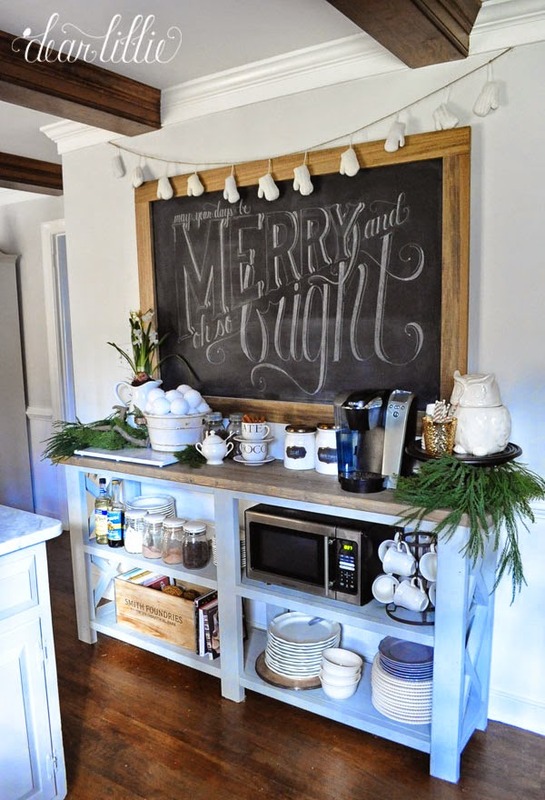 Please share where you found your 3-tier stand that is on your kitchen table. I have been looking everywhere. Thank you! 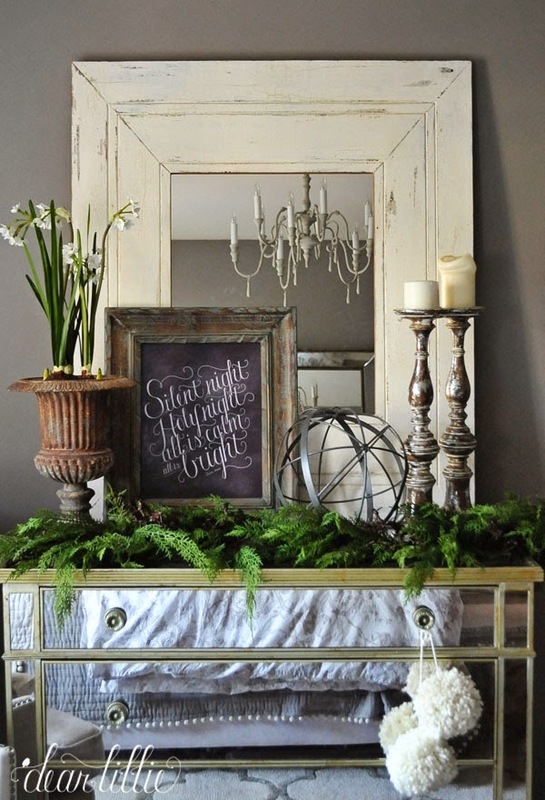 You're home is a decorating inspiration. So beautiful! Thank you! 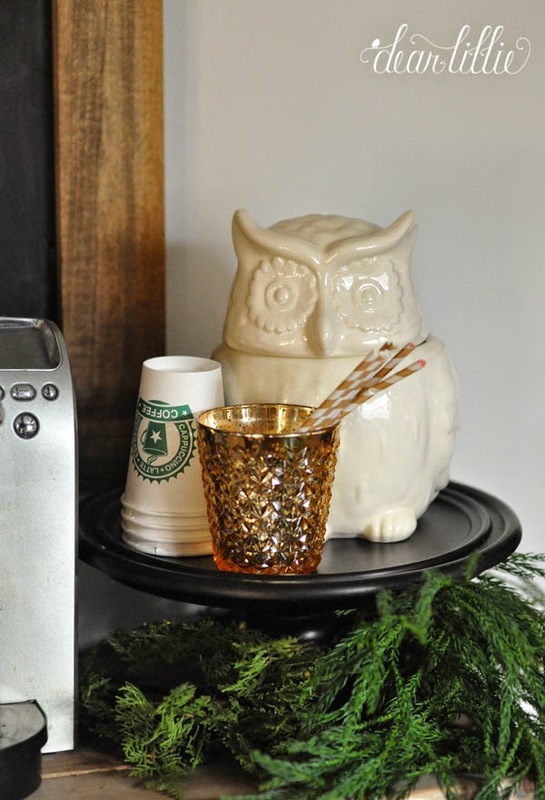 You can find the three-tier stand online at a store called Mythology. I had no idea you guys were making signs! WoW! 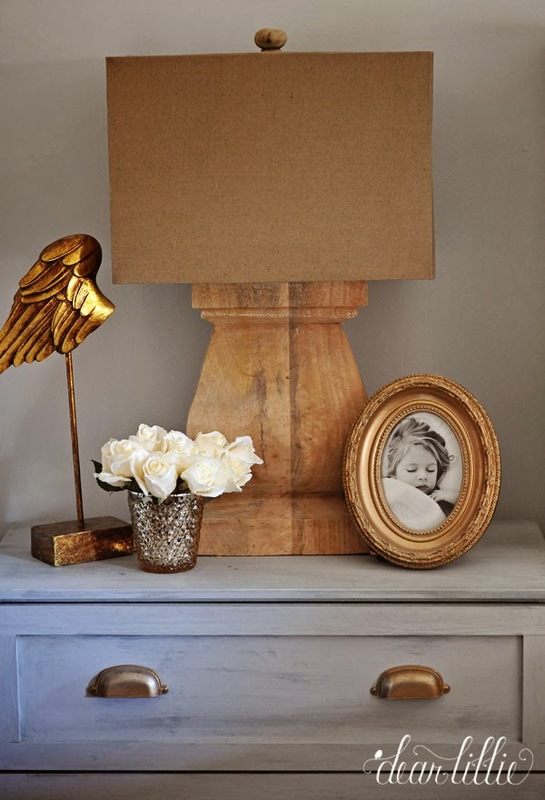 love the home...every detail is stunning. I love how you decorated for the holidays. So many lovely pictures and inspiration. 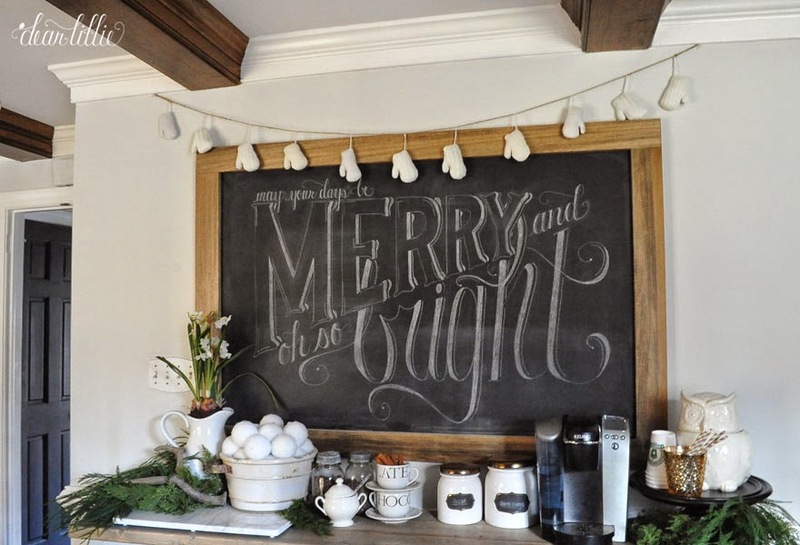 I love the kitchen chalkboard and little mitten swag. Super cute!! I can't stop looking at these photos. I have looked forward to your photos all year. It is a wonderful time of year! Your home is so so beautiful. I love it all! Thank you so much for being a part of the tour again and sharing your home! Everything is beautiful! Gorgeous! 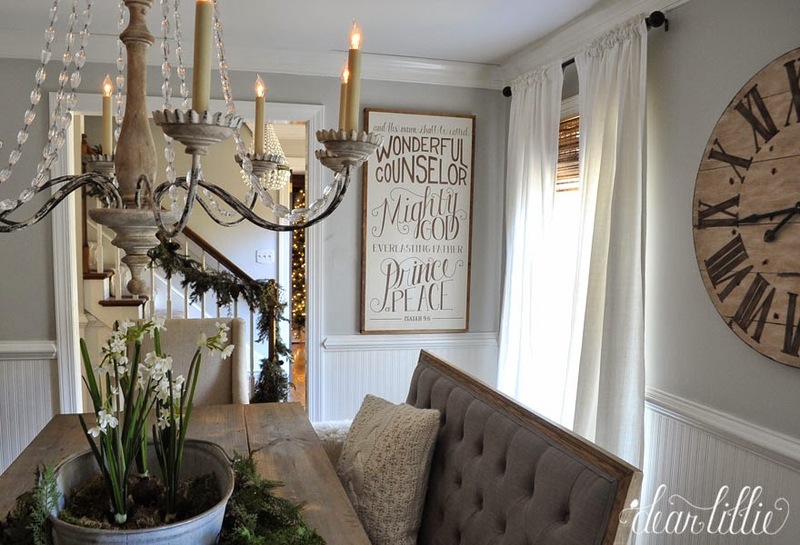 I love how you decorate. 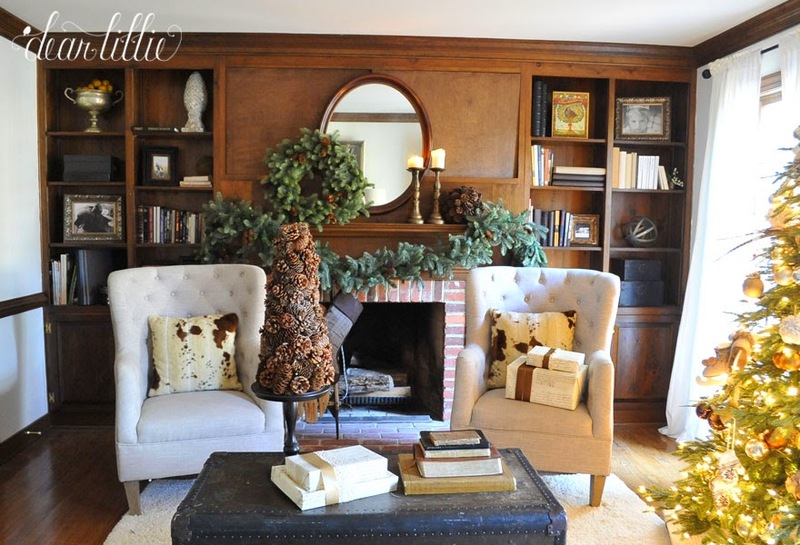 Your home feels so warm and inviting for the holidays. Your home is so warm and inviting...I could move right in. 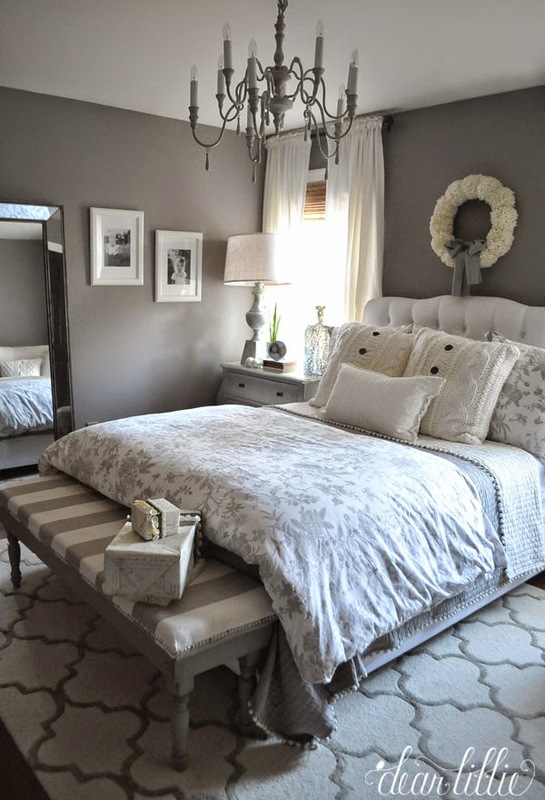 Would you mind sharing the source for the rug in the master bedroom...I need one identical. 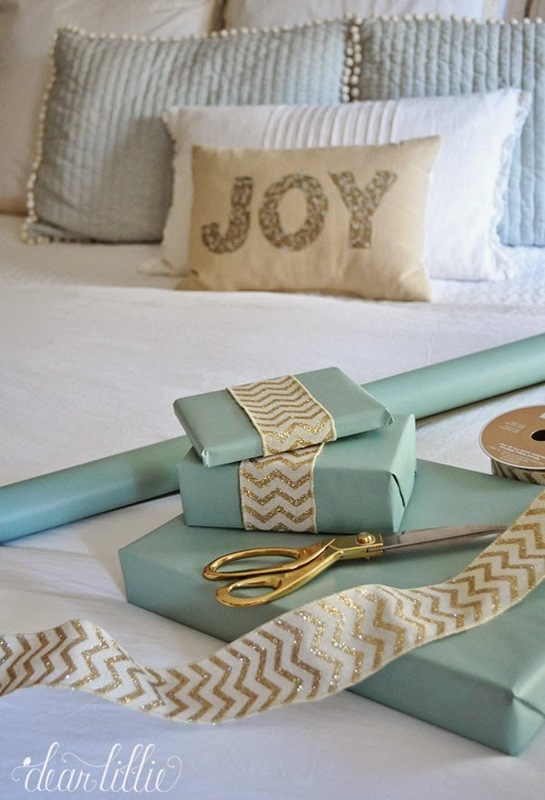 Jennifer, your home is one of my favorites at any time but you do Christmas so well! I can't tell you how much you have influenced my own home decor after finding your blog several years ago. Thank you so much for sharing your beautiful home with us. 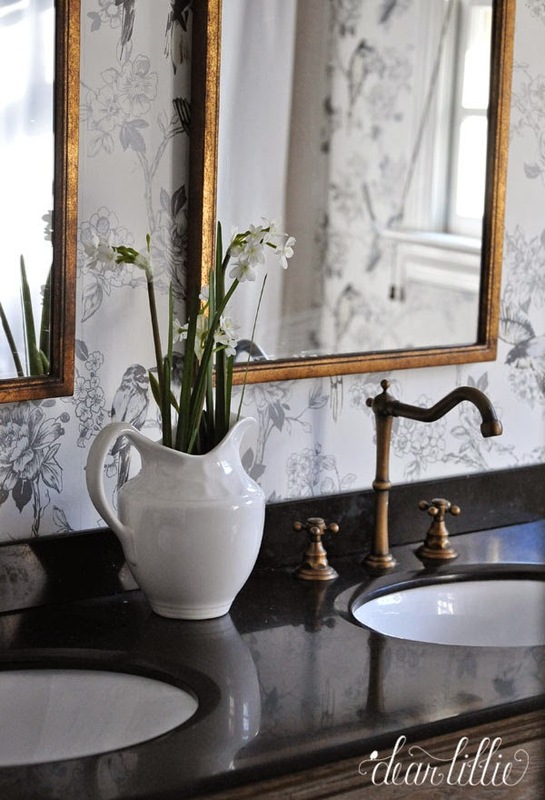 Looking for Savvy Home and Garden online, as I would love to know more about the paperwhites you used in your decorating. All I can find is the website for a furniture store in Williamsburg. Is there a link we can go to to see/purchase these? Thanks in advance for your reply! Enjoyed visiting your lovely home. Hi! I was wondering if you could provide a link for Savvy Home and Garden, where we can see/purchase the paperwhites used in your decorating. The only website I can find is a home furnishings store in Williamsburg, and I don't see the paperwhites anywhere (mostly furniture). Thanks in advance for your reply! I enjoyed visiting your lovely home. Hi, Tori! You can visit their site here (http://www.savvyinwilliamsburg.com) or my clicking their button on the side of our blog! Everything is so lovely! Glad I was able to finally see everything today...my computer was acting up yesterday every time I tried to take the tour. Simply stunning...and I love that little white BH tree! So cute! Your home is absolutely stunning!! I love everything!! 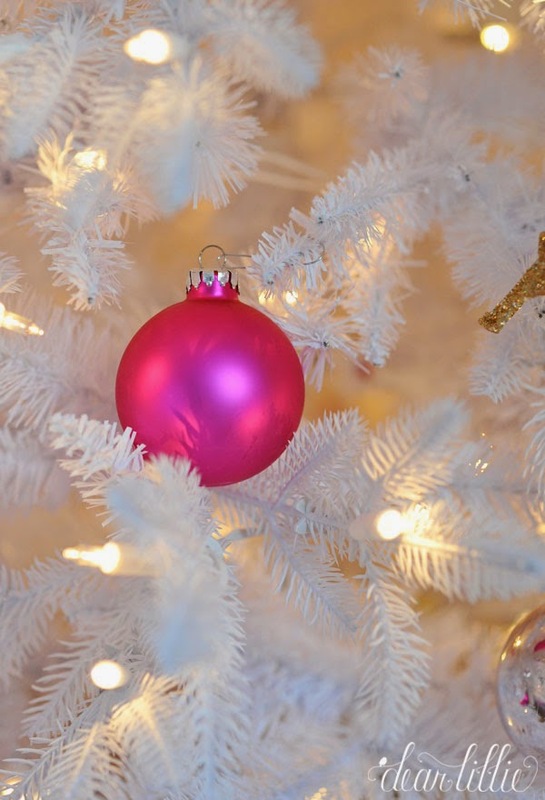 Looks beautiful and love the white and pink tree . So sweet! Thanks, Eileen! Our tree is called the Brewer Spruce! This home is gorgeous! WOW!!! 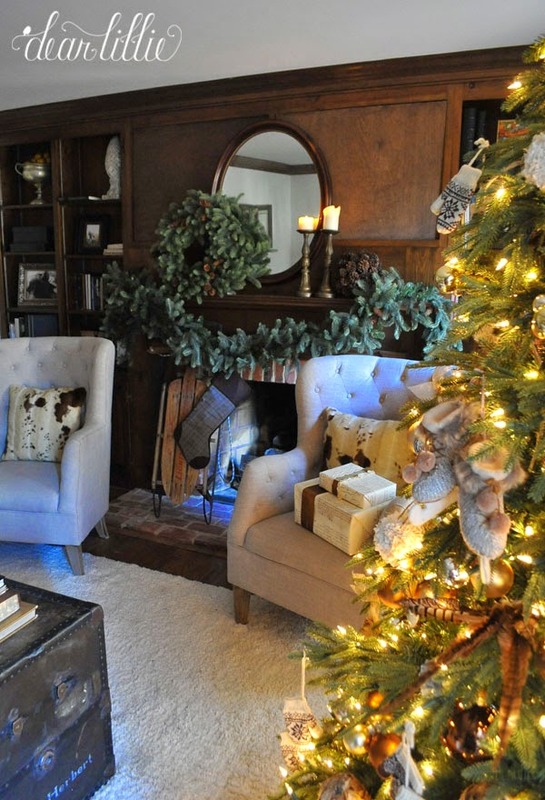 So cozy and perfect for Christmas! So lovely Jenny! Every detail is so pretty. You are so talented! 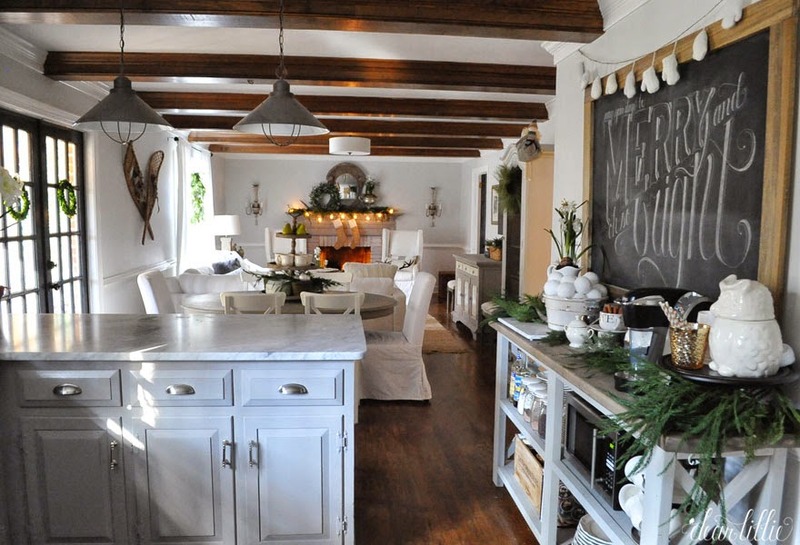 Love the simplicity of your home! It is beautiful! I love your girls area. Such fun colors!! Gorgeous, as always Jennifer! I am always so inspired by your home. Love your snow shoes, just bought I pair myself , what a beautiful touch! Happy Holidays!!! 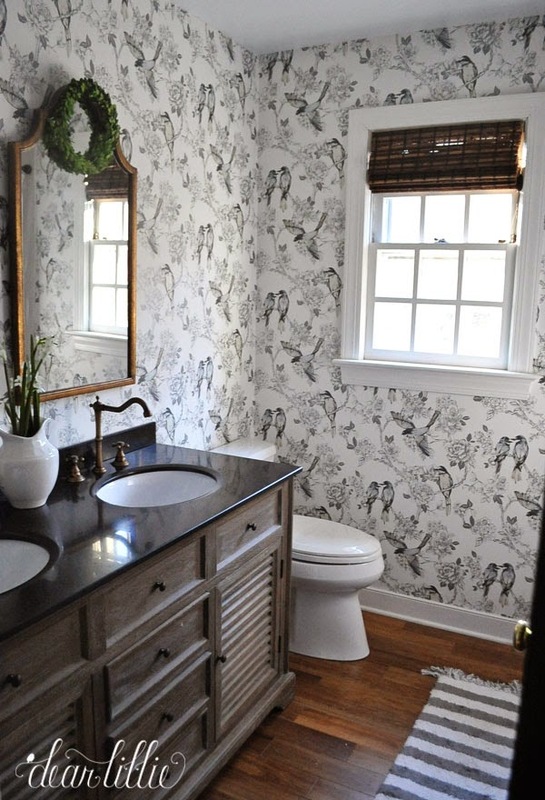 Your home is absolutely beautiful, Jennifer! I just love your style! Jennifer everything is stunning!!! 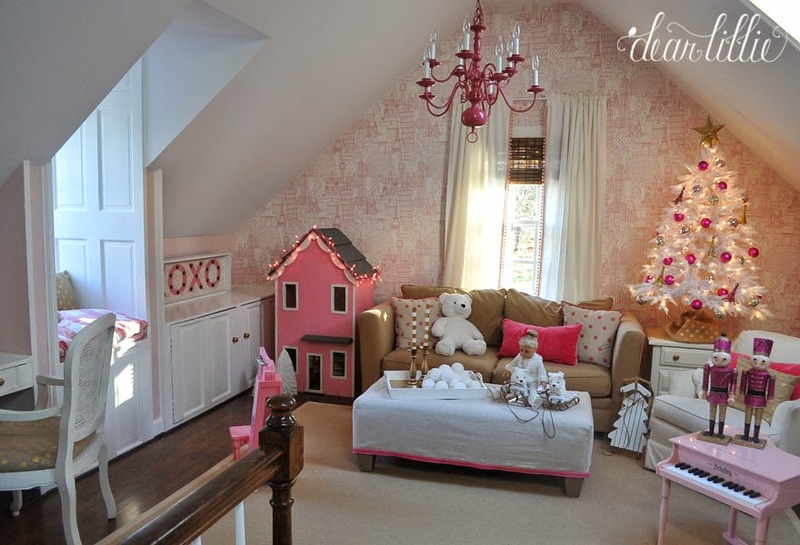 I think my most favorite was the playroom though. That would have been my dream come true as a little girl...or as a big girl too. LOL! So thrilled to be part of the housewalk with you! Thanks, Nancy! It is from Wallpaper Direct. I believe there is a link to the exact product on our "our home" page (but I'm not positive). 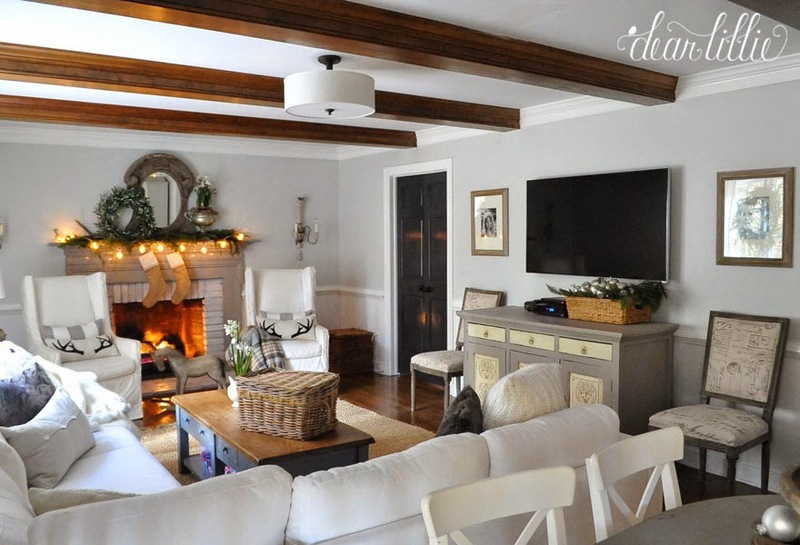 I love looking at your beautiful home, thanks for sharing. 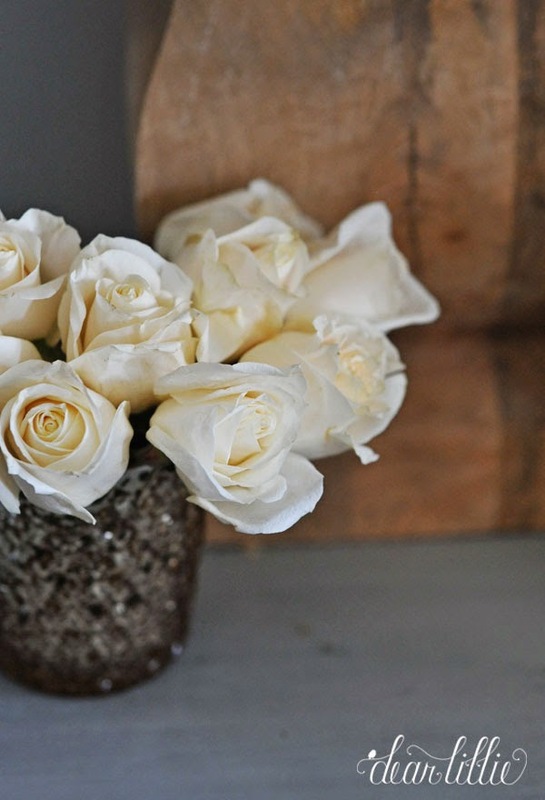 Hi, regarding the faux paperwhites, I clicked the link but it doesn't appear they sell them online? Do you have an online source for them? Love them and your home. Thank you. Thanks! Unfortunately we haven't ever purchased any online so I don't have any tips--sorry! Your home is exquisite! I have admired each and every area and rooms. BEAUTIFUL!!!! Happy Holidays! 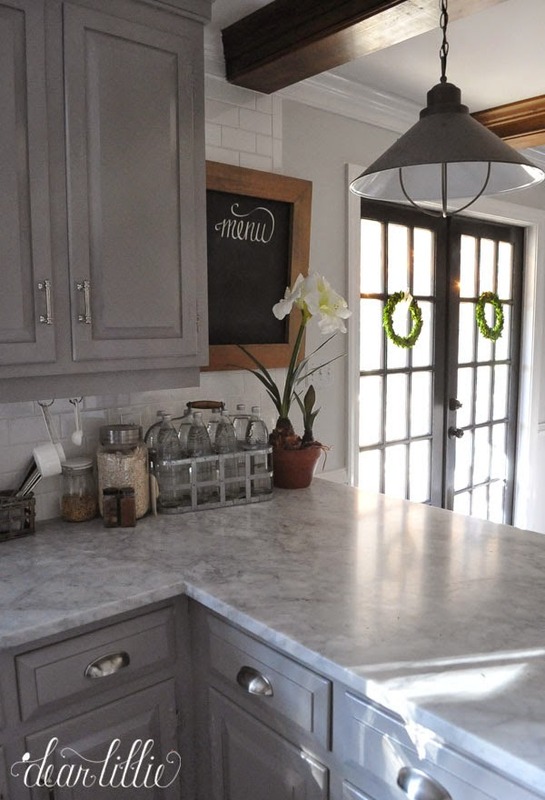 I just found your blog through the Home Tour. 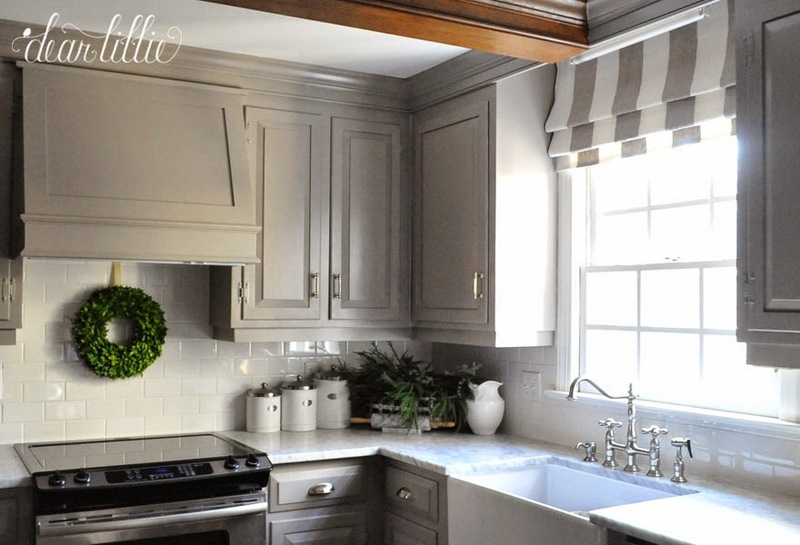 Your house is just beautiful and your kitchen is to die for! Jennifer,your home is beautiful ! The colors blend so well and your attention to detail is amazing.What a wonderful home to raise your family in.Have a Merry Christmas and Blessed New Year.